“As the 19th century began, a darkening shadow moved across Europe. This shadow was propelled by the voice of one man, Napoleon Bonaparte. Only Russia and England offered impressive resistance. Over Russia, the weather was clear, the sun was shining. Napoleon was 1,000 miles away, and the streets of Moscow were excellent for parades...”. The story begins in 1805, a few months before the great battle of Austerliz and points out a massive panorama of the Napoleonic invasion of Russia in 1812 and its consequences on the destinies of some characters of the aristocratic families and also of the Russian people. Moscow, 1805. Although he is secretly in love with the young and beautiful Natasha Rostov, Pierre Bezoukov married his cousin Helene whom does not love him and looks more interested in Pierre's big estates. Of course, the marriage comes as a failure. Pierre's best friend, Prince Andrey Bolkonsky is a soldier and returns from the battle of Austerlitz wounded. Some years later, Pierre introduces Andrey to Natasha Rostov and the pair fall in love. In 1812, Napoleon invades Russia. Before Natasha and Andrey can marry, Andrey is sent to the battle (Borodino) where he is mortally wounded. Pierre, a pacifist, goes along the battlefield. He is horrified and he decides to kill Napoleon. The French army wins the battle. The Russian people evacuate Moscow. Natasha and her family take refuge in a monastery away from the town, where the young girl is reunited with Prince Andrey who is on about to die. Pierre fails in his attempt to kill Napoleon and is taken prisoner and forced to march with the French back to France. The winter comes and the retreat of the French army is painful. Many soldiers die killed by the cold. At the battle of Berezina, the Russian army defeats Napoleon's army. 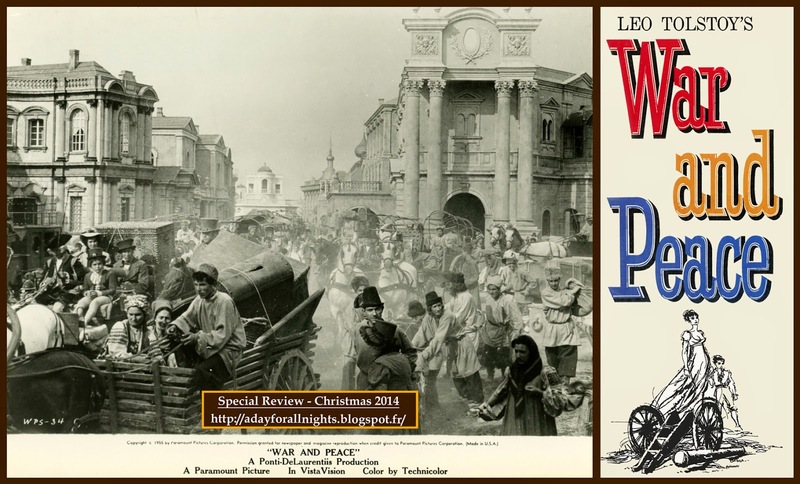 Pierre can escape and returns to Moscow with many soldiers and civilians to rebuilt their country with the new peace. Later, he finds Natasha and tells her of his love. They marry. "Voyna i mir" (“War and Peace”) published in 1869 is considered with “Anna Karenina” (1877) as the greatest novel achievement of one of the greatest Russian philosopher-writer : Lev Nikolayevich Tolstoy (1828-1910). 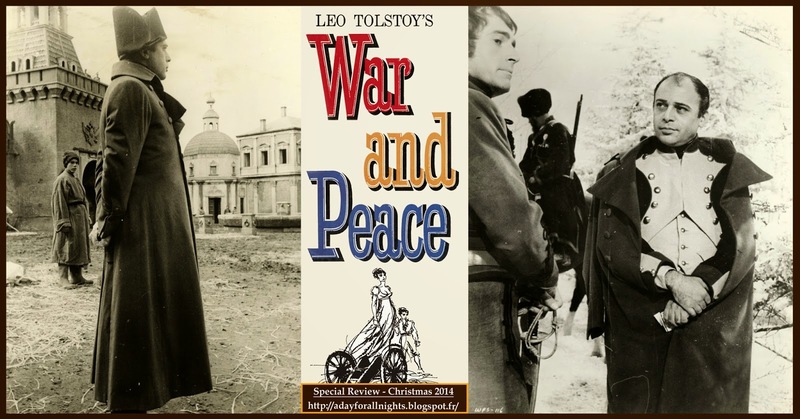 From several studies it would appear that "Voyna i mir" (“War and Peace”) was the result of a long meditation and many historical researches made by Tolstoy during many years, from 1864 to 1869. Many historians regard that the great Russian philosopher wrote this story as a long poem and not only as an epic novel or a historical chronicle of the Russia during the Napoleonic era. 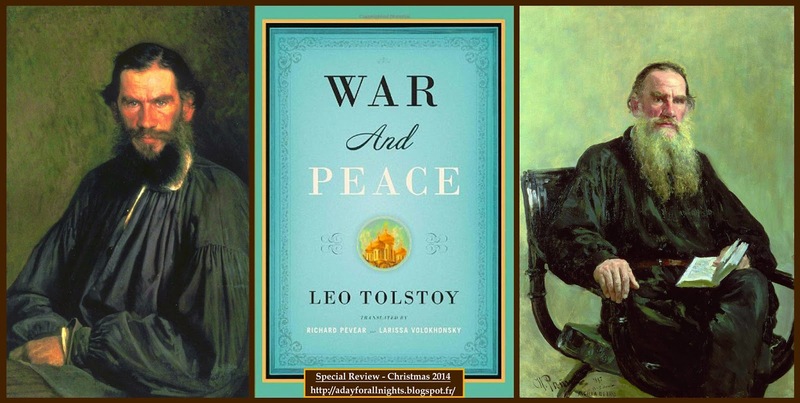 Everyone will agree with me to say that Tolstoy’s novel remains a great journey into the deep of the human soul and an appeal to a better understanding between people for keeping our world in Peace and away from War. Selznick hired the brilliant screenwriter Ben Hecht, while Michael Todd hired the talented director Fred Zinnemann and the screenwriter Robert E. Sherwood. Despite this huge competition, two Italian producers, Dino de Laurentiis and Carlos Ponti were also interested in making the movie and succeeded in convincing the Paramount Studios to grant important facilities to their Italian studios while, on their side, the two producers gathered $6 million to complete the general budget ! Eventually, MGM, Selznick and Todd halted their plans to bring Tolstoy’s masterpiece to the screen. During many years, Dino De Laurentiis was one of the most prolific film producer, and he was regarded as one of the “Last Tycoon” of the International cinema Industry. During the period from 1946 to 1950, the young Italian De Laurentiis was hired as executive producer by the famous Italian Company “Lux Film”. He gained his first major success “Riso Amaro / Bitter Rice” (Giusepe De Santis / 1949) with the famous actress Silvana Mangano who eventually became his wife. Then, he created a partnership with Carlo Ponti : “The “Ponti-De Laurentiis” company. In 1956, he left Ponti and developed his own company : “De Laurentiis Cinematografica”. From the mid 50’ until the yearly 70’, he achieved some success but also some failures with blockbusters such as “Barabbas” (Richard Fleischer / 1961), “The Bible : In The Beginnig” (John Huston / 1966), “Diabolik / Danger : Diabolik”(Mario Bava / 1968), “Barbarella” (Roger Vadim / 1968) and “Waterloo” (Sergei Bondarchuck / 1970). In 2001, he was awarded an Oscar for lifetime achievement and produced in 2007, his last movie “The Last Legion” directed by Doug Leffer. Carlo Ponti is not only known as the husband of the gorgeous and talented Italian actress Sophia Loren, he also was, like his friend De Laurentiis, a very clever showman. 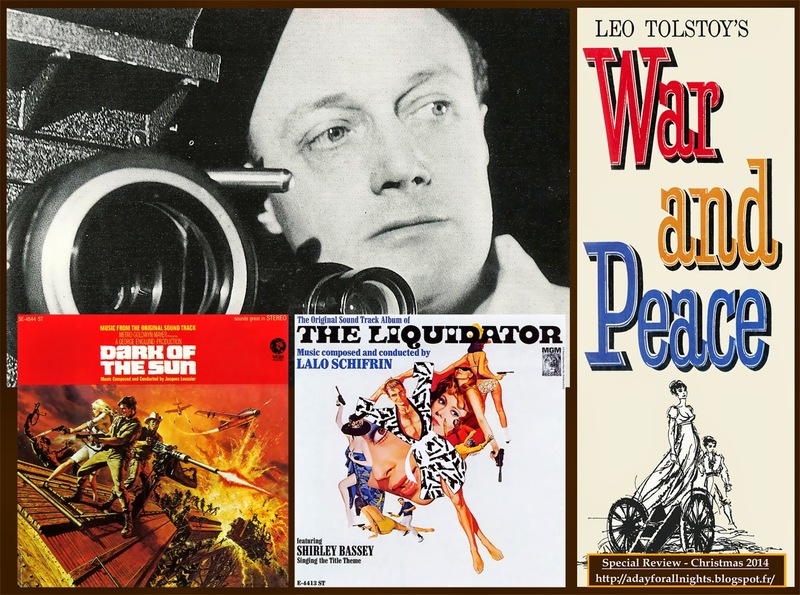 He produced many great successful movies, notably “Doctor Zhivago” (Sir David Lean) with the help of the Metro Goldwyn Mayer Studios (MGM) which won 5 academy awards in 1965 ! 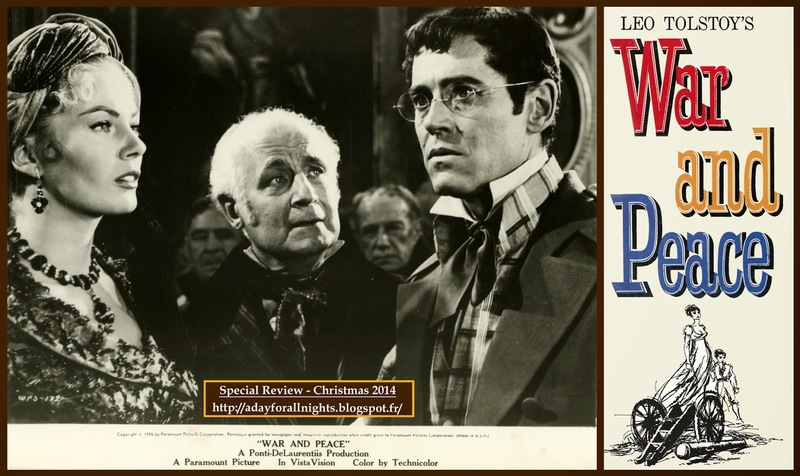 In his autobiography “A Tree is a Tree” (1982), King Vidor reminded that he was very excited when Dino De Laurentis approached him to direct and adapt for the screen, Tolstoy's novel "War and Peace”. With D. W. Griffith and Cecil B. DeMille, King Vidor was a pioneer of the Golden Age of Hollywood. He began his wonderful career in the silent era and very soon he became a familiar of epic movies. 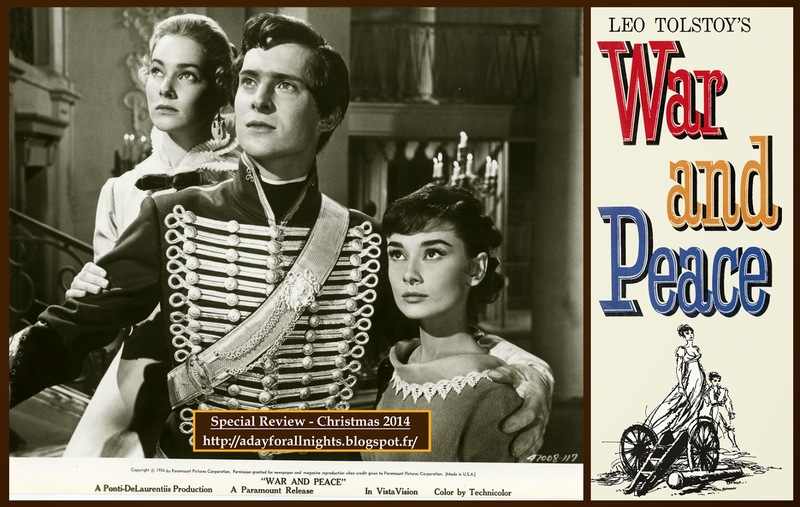 In 1925, he directed “The Big Parade” which later was as an inspiration to Sir David Lean for “Doctor Zhivago” (1965). Among his most famous films are “Northwest Passage” (1940) and “Duel in the Sun” (1946). His last movie was the marvelous “Salomon and Sheba” (1959) which was unfortunately the last film portrayed by the legendary actor “Tyrone Power” (1913/1958) who died on the set. He was replaced by another iconic legend, Yul Brynner (1920/1985). In 1979, King Vidor received an Academy Honorary Award for his incomparable achievements as a cinematographic creator and innovator. He received the prize from the hands of Audrey Hepburn. A high class International cast ! 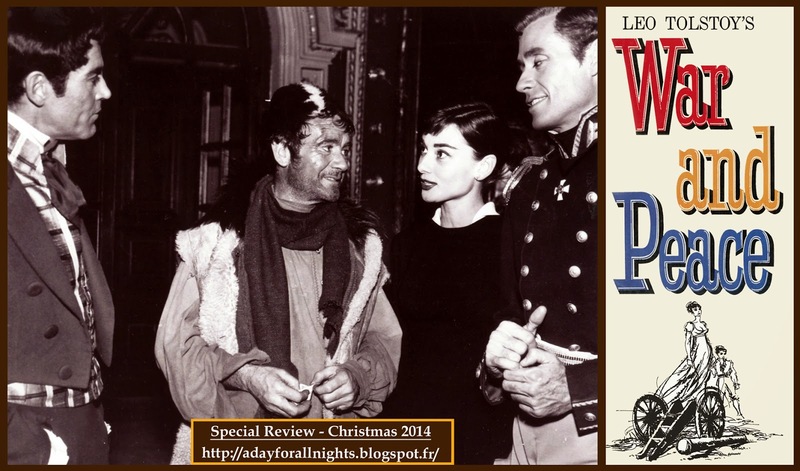 Early 1955, King Vidor was able to convince Audrey Hepburn and Mel Ferrer to participate to the movie as the main stars. In fact, he regarded Hepburn as the ideal choice for the part of countess Natasha Rostov with her husband Mel Ferrer who agreed to portray the character of Prince Andrey Bolkonsky. 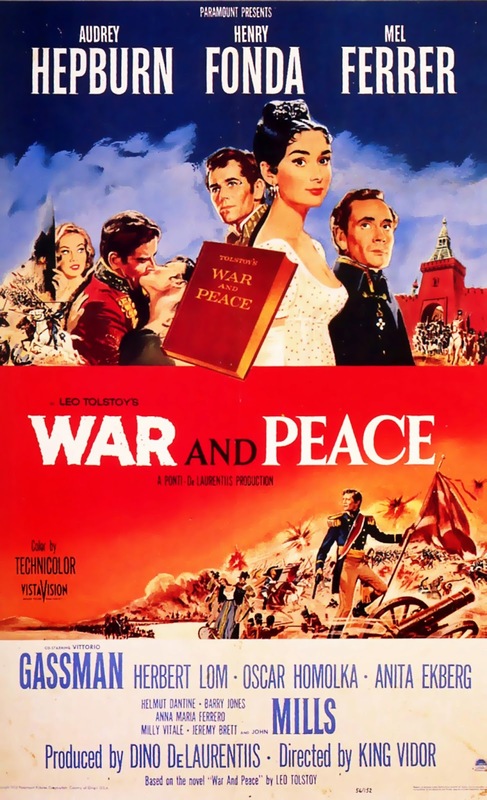 Some European actors joined the cast, among them : “Vittorio Gassman (as Anatole Kuragine), Anita Ekberg (as Helene Kuragine), Herbert Lom (as Napoleon Bonaparte), Oscar Homolka (as General Kutuzov), John Mills (as Platon Karataev), Helmut Dantine (as Captain Dolokhov),Jeremy Brett (as Nicolas Rostov), May Britt (as Sonia Rostov), Tullio Carminati (as Prince Vasili Kuragine), Barry Jones (as Count Rostov), Milly Vitale (as Lise), Lea Seidl (as Countess Rostov), Anna-Maria Ferrero (as Mary Bolkonsky), Wilfrid Lawson (as Denisov), Sean Barrett (as Petya Rostov) and Alan Furlan (as a Russian Officier) …”. To help Vidor, the versatile Italian director Mario Soldati (1906-1999 / “La Provinciale” (19853) ; “La Donna del Fiume” (1955)…) was chosen as the director of the second unit in charge of the main action sequences : “Austerlitz battle, the French retreat and all Napoleon’s scenes”. He was helped by the director of photography Aldo Tonti (1910-1988 / “Barabbas” by Richard Fleischer(1962) ; “Cast a Giant Shadow” by Melville Shalvelson(1966)…). The producers understood they had to impress the audience all over the world, and they decided to shot the movie with the best available material by using the new Vista Vision cameras so they can capture the magnificent story in color (Technicolor). The best man to succeed this challenge was the famous British cinematographer, Jack Cardiff (1914 - 2009). They got their man ! For the records, let us remind that, with Freddie Young (1902 - 1998) and Geoffrey Unsworth (1914 - 1978), Jack Cardiff was one of the best British cinematographer of the period. He also directed several movies. His first movie as a director was the unfinished film with the Hollywood icon, then at the end of his career, Errol Flynn, “The story of William Tell” (1953). Too bad ! It can also be pointed out his fruitful collaboration with the Australian born actor Rod Taylor (“Young Cassidy” (1965 / see the topic), “The Liquidator” (1965) and “Dark of The Sun” / “The Mercenaries” (1967 / 1968)). 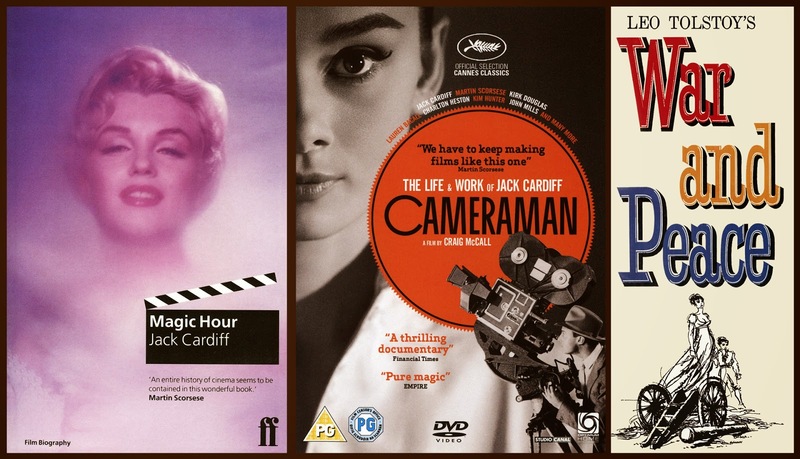 Also, some people may be interested in hearing that one year after Cardiff’s death, a documentary film “Cameraman : “The life and Work of Jack Cardiff” was shown during the 2010 Cannes Festival. In this film, the veteran cinematographer - director reviewed his prolific career with a great sense of humor and nostalgia. In his autobiography “Magic Hour”, the cinematographer described the many challenges he had to solve to make each scene a decisive moment of the story, especially in the duel sequence where Pierre (Henry Fonda) and Dolohov (Helmut Dantine) faced each other at forty paces on an “exterior” snow landscape which had to be "created" in the Cinecittà studios. In that specific moment, we can see the audacious lighting effects used by Cardiff with an immense ingenuity and a great professional conscience. Even after so many years, the result remains wonderful !!! 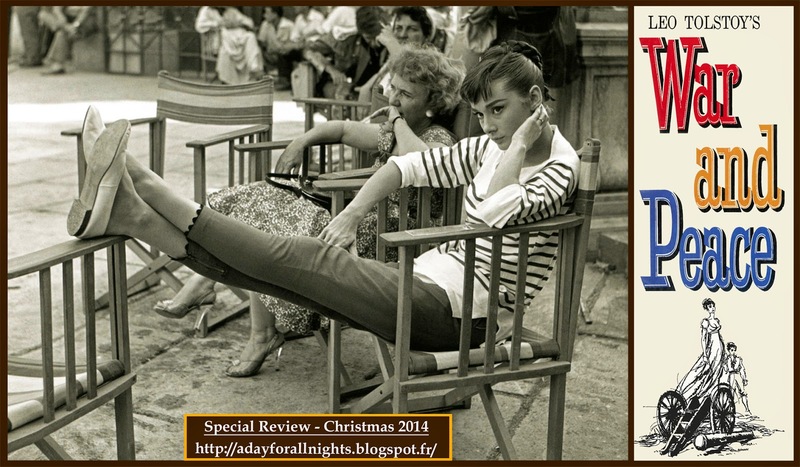 Several times, the producers delayed the start of the shooting of the movie because of the Audrey Hepburn’s schedule. 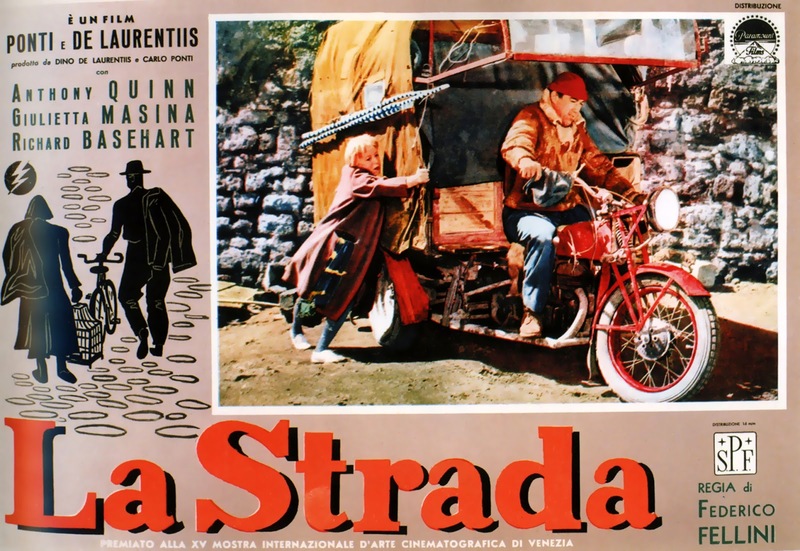 At last, in the summer of 1955, the filming of the Paramount Picture began in Italy at the Cinecittà Studios (for reference, eleven mammoth sound stages in Rome, plus six additional stages were required to shoot the movie) ! The talented Italian costume designer Maria De Matteis (1898-1988) was in charge of the costume and wardrobe department. Her work was so impressive that she was also nominated for best costumes at the 29th Academy Awards Ceremony. Three hundred large cases where needed to carry the costumes worn by 18 000 soldiers in the battles scenes. For winter scenes, the producers used 20 thermostatically-controlled cases to preserve the furs. A lot of researches on the Napoleonic period were made so the uniforms were as far as possible in conformity with the reality. To achieve this goal, 90 Florentine tailors were busy during half a year. An entire Swiss button factory worked days and nights to manufacture 100 000 military buttons in due time. Audrey Hepburn’s costumes alone cost $ 50 000 ; Fonda’s and Ferrer’s cost $ 15 000 ! Soldiers’ costumes and equipment cost $ 750 000 ! To produce the 200 old-type cannons requested by the production, new casting had to be done, as the only cannons surviving the Napoleonic period are under the responsibilities of museums as historical material ! The great battles of the pictures are Austerlitz, Borodino and Berezina. To train the soldiers, 165 expert drillmasters worked for a month. 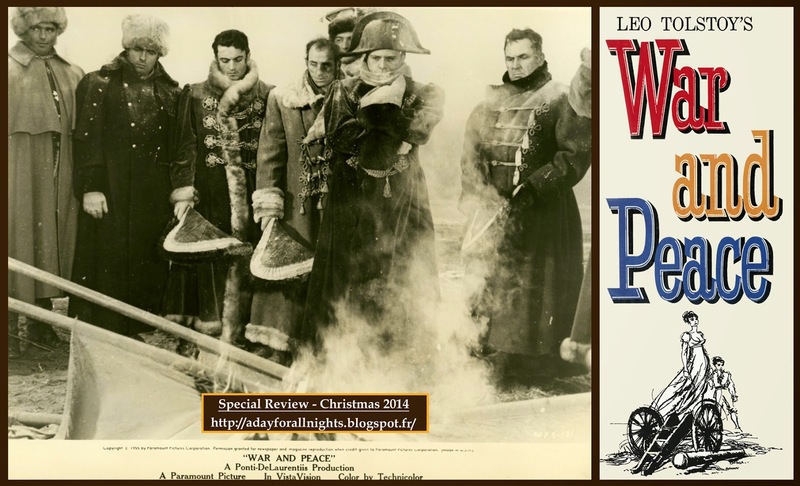 The producers choose the great Italian production designers Mario Chiari (1909-1989) and Piero Gherardi (1909-1971) who were in charge to build several sections of Moscow as it appeared in the early years of the 19th century. This set was built on a ground outside of Rome. It required 120 000 feet of structural steel. Also, for the filming of the Berezina battle scenes, the construction of an entire village was required to guest 11 000 people and 3 000 horses. “When we were filming the Movie in Italy, we had thousands of troops playing Russians and Frenchmen for the battles scenes… I arrived on the set one morning dressed as Napoleon and the first assistant director came to me and said “Could you spare twenty minutes, Mister Lom ?” He pointed a queue of about two hundred men and this assistant director, “they want to meet Napoleon” I said “You are joking” He replied “No, no they‘re all officers, and they’ve expressed a desire to meet you and shake your hand”. So in my Berman uniform I had to stand there and shake every one of them by the hand, and keep my expression very serious. 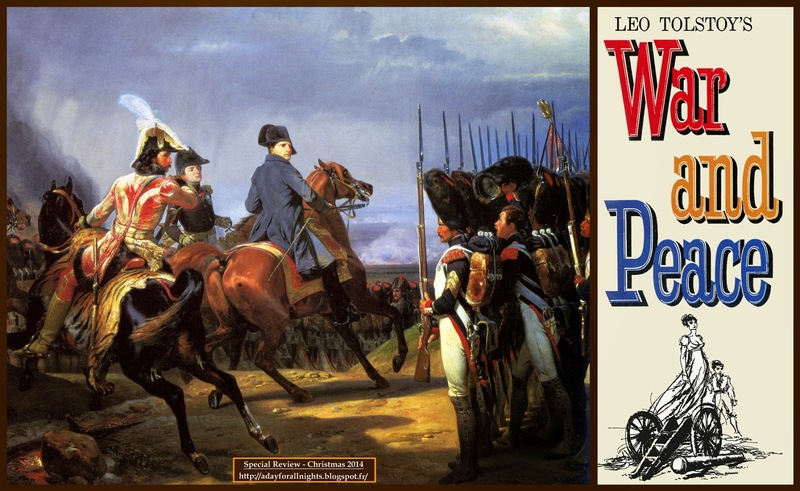 They were clicking their heel, and with great respect they all shook hands with Napoleon…”. 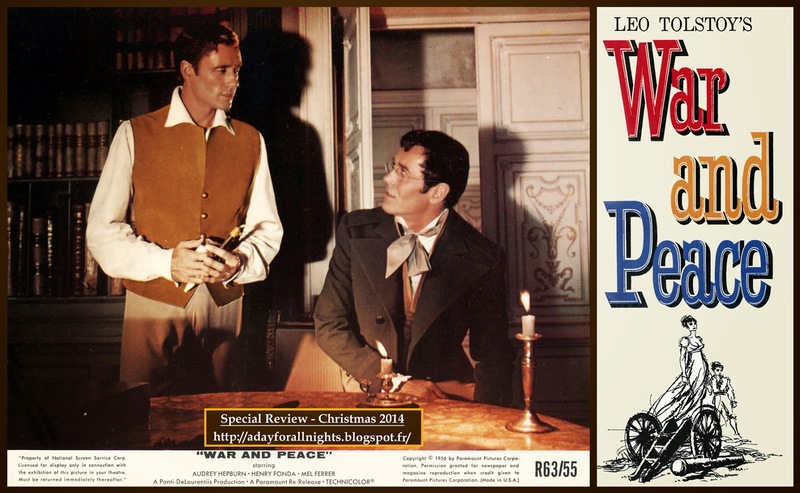 Henry Fonda disliked the way Vidor and De Laurentiis wanted he played his part. “I remembered once overhearing a conversation between King Vidor and Hank Fonda. Hank objecting to a line in the script, and he said “Gee, I can’t say that. It doesn’t feel real”. Vidor replied “Of course it isn’t real. It‘s a movie !””. Like Gary Cooper and James Stewart, the career of Henri Fonda was one of the most outstanding of the American cinema history. For the American audience, Fonda always personified the perfect side of the human integrity and moral social conscience. For these reasons, he was chosen several times by many legendary American Directors like John Ford (“Young Mister Lincoln” (1939), “The Grapes of Wrath” (1940) and “My Darling Clementine” (1946)…), Sydney Lumet (“12 Angry Men” (1957) and “Fail Safe” (1964) and Otto Preminger (“Advise and Consent” (1962) and “In Harm’s Way” (1965)). With Carlo Rustichelli (1919-2004), Mario Naschimbene (1919-2002), Alessandro Cicognini (1906-1995) and Angelo Francesco Lavagnino (1909-1987), Nino Rota (1911-1979) was one of the most versatile Italian film composer in 50’ and 60’. In 1955, Rota was already a well established composer. His work in the film industry dated back to the 40’. The name of Nino Rota was well known by the cinematographic historians and movies fan because of his audacious and stupendous artistic collaboration with the legendary Italian director, Federico Fellini. 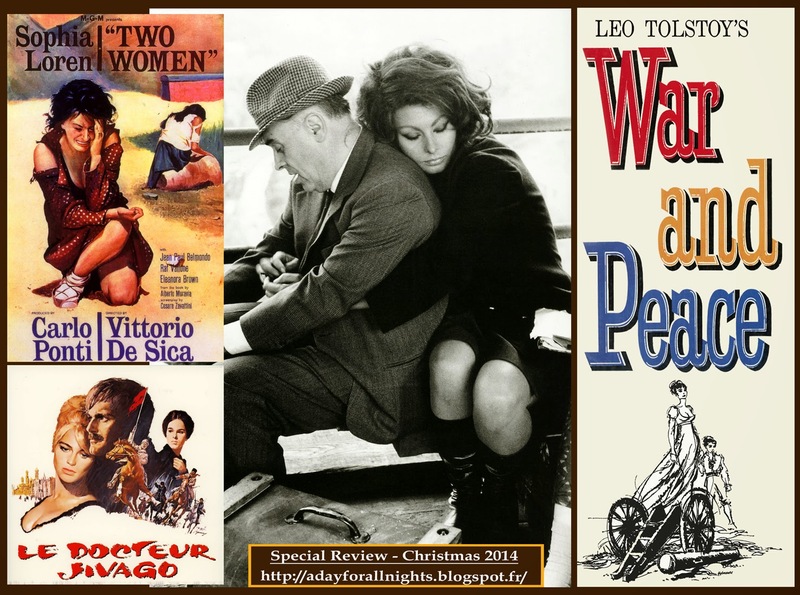 The year before “War and Peace”, “La strada” (Federico Fellini / 1954) was a huge success, the producer of which was the “Ponti-De Laurentiis” company. He was also his second collaboration with Fellini. During thirty years, Rota wrote all the movie scores for Fellini’s films from “Lo Sceicco Bianco / The White Sheik” (1952) to “Prova d’orchestra/ The Orchestral Rehearsal” (1978) ! He also had ongoing relationships with Luchino Visconti, for whom he scored “Rocco and his brothers” (1960) and “The Leopardo” (1963) and Franco Zeffirelli, for whom he scored “The Taming of the shrew” (1967) and “Romeo and Juliet” (1968). The love theme became a huge universally popular success. He met again a popular success with the first two scores of “The Godfather” Saga (Francis Ford Coppola / 1972 / 1974) and shared an Oscar (“The Godfather, Part II” / 1974) with Carmine Coppola who supplied him for the arrangements of the source music in the both movies. Once again, the main theme of the movie “The Godfather’s Waltz” became a popular vocal hit. His last memorable scores were the Agatha Christie mystery “Death on The Nil” (John Guillermin / 1972) and “Hurricane” (Jan Troell / 1979). 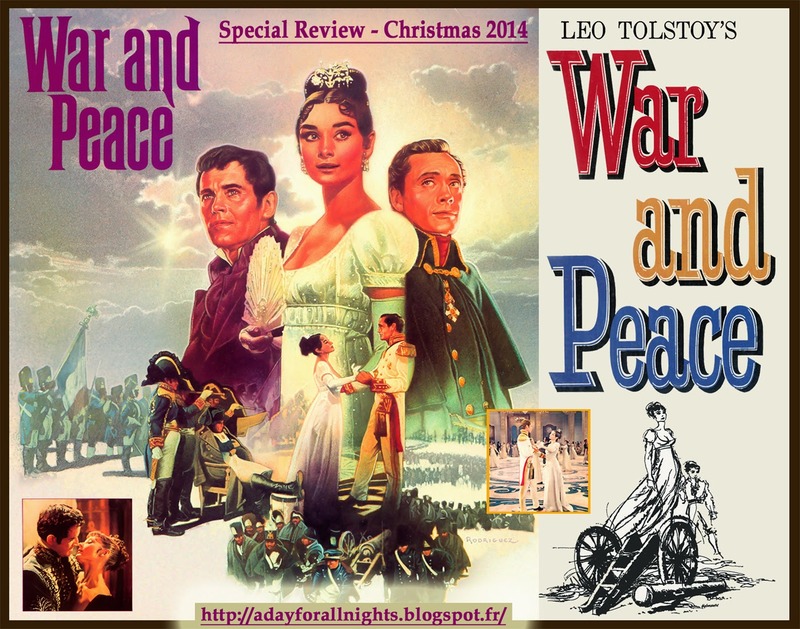 “War and Peace” gave him the opportunity to write in a grand symphonic style. Rota composed a beautiful romantic score and succeeded to merge a great symphonic score and the Russian folklore music with a great ability. For the magnificent ball sequence, Rota composed several waltzes and especially “The Natasha’s Waltz” for Audrey Hepburn and Mel Ferrer’s dance. 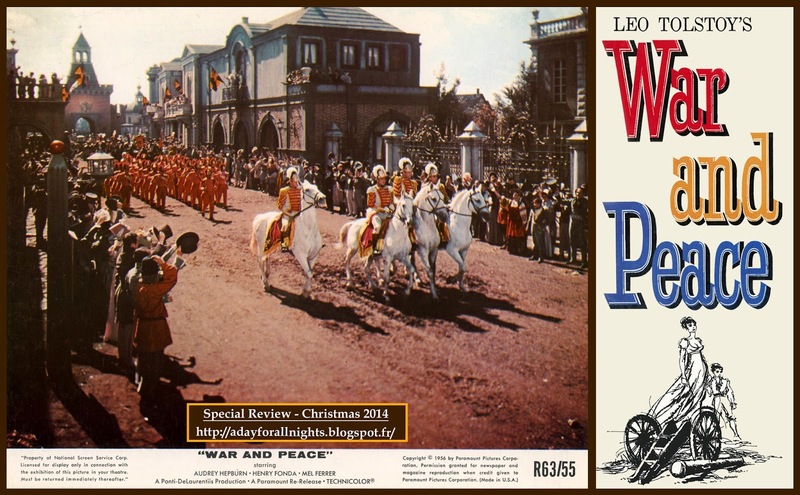 Later, he will use again one of these waltzes for another great epic film produced by De Laurentiis : “Waterloo” (Sergei Bondarchuk / 1970). To celebrate the greatness and romantic Russian spirit, Rota used a great chorus for the song “The Rose of Novgorod” which became a very popular tune. For each character, he wrote a personal and singular theme. When the characters of Pierre or of Prince Andrey's appear on the screen, we can perfectly recognize them thanks to the music and also get a better understanding of their respective psychological minds : “the innocence and the anxiety of Pierre or the dignify spirit of the Prince Andrey”. 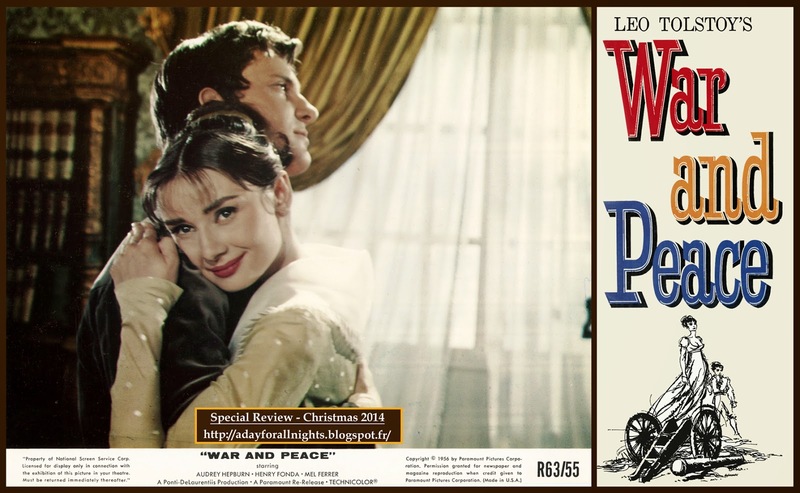 For me, the brilliant score of Rota’s “War and Peace” (1955) is his answer to the famous Tchaïkovsky’s “1812 Overture” (1880) and can be regarded as a tribute to the Legendary Russian Artist and also to Prokofiev‘s Opera. A great step in the musical world history was achieved ! For the promotion of the film score, Columbia Records produced a LP Album and Franco Ferrara conducted the orchestra. Unfortunately, the recording was released in monophonic sound, but the elegancy of Rota’s score remained intact. In 1989, for the first time, the US Label, Varese Sarabande, released the original score on a Compact Disc. Later, another Compact disc version was available by the Cherry Bed Records (2008). But, despite some efforts, no one of these recordings gave justice to the actual score. For his concerts in the 70’, the famous Italian artist arranged his score in a large symphonic suite in three movements and recorded it with some of his great scores for Fellini and Zeffirelli movies for the Italian music editor Cam Records. 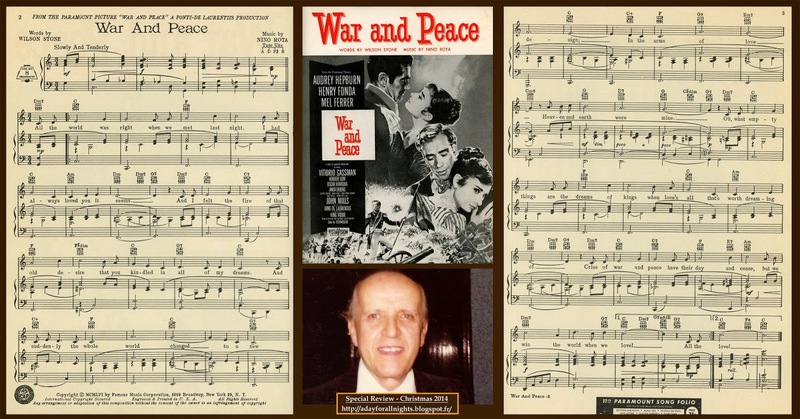 Today, the “War and Peace” concert suite prepared by the composer himself for the ”Filmharmonic” event in London (1973). This suite can be heard in concert halls all over the world. Just to conclude my salute to Nino Rota, I would like to remind of a critic of the score by Didier c. Deutsch who praised the work of the composer in his book “Music Hound Soundtracks”. 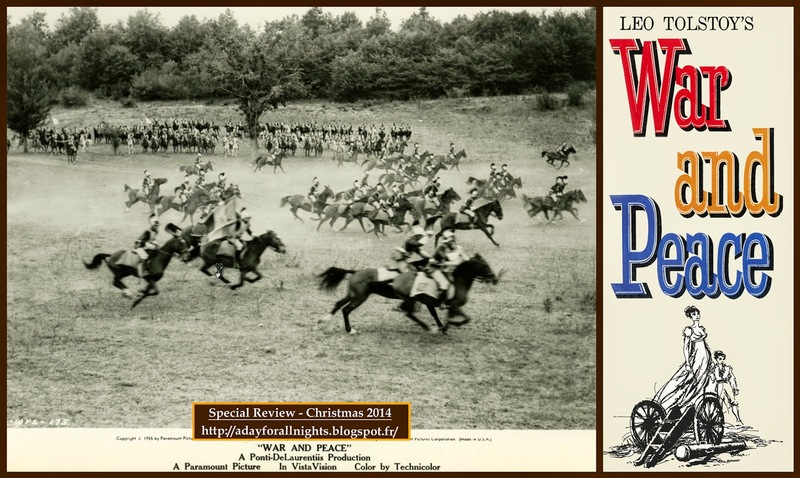 “…Opulent and magnificently mounted, the production also offered Rota with many set pieces, where his lyrical inspiration took a free flight “The Battle of Austerlitz”, “The charge of the Cavalry”, “Exodus from Moscow”, “Napoleon’s Retreat”), all of which resulted in cues that are still impressively dramatic and powerfully appealing today. One of the film’ most ravishing scenes, whirling ballroom sequence, inspired him to create a lilting waltz (Natasha’s waltz), as fresh and lovely as anything he wrote for the screen, that beautiful captured the giddy atmosphere of the situation. Despite the fact that the recording is in mono, it has all the sweep and magnificence one associates with this super production”. 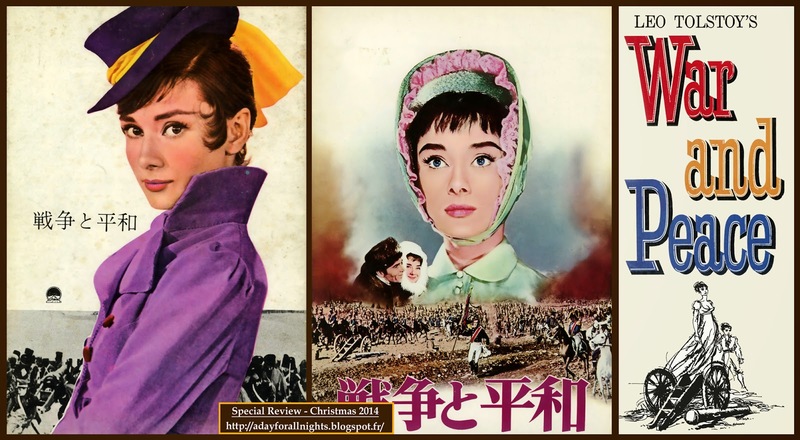 "Audrey Hepburn was born to portray Natasha"
The shooting took four months. 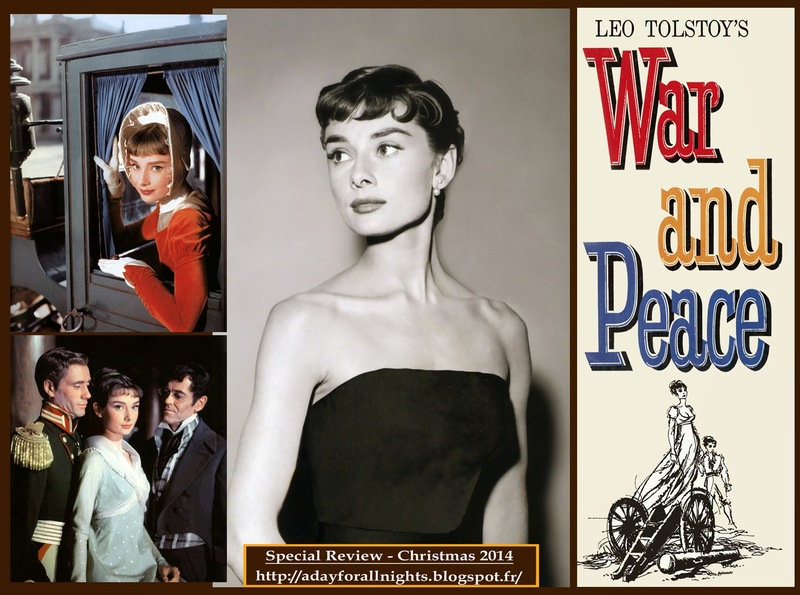 Despite a lot of logistic difficulties during the making of the movie and thanks to the help of Vidor, the radiant Audrey Hepburn succeeded in portraying marvelously the stages of Natasha’s development : “foolish and selfish at first, she matures by living through the disruptions of war and of romantic disappointment”. She was born to play the young aristocrat Natasha Rostov, If we refer to Tolstoy’s description of his character : “A dark-eyed girl, full of life, with a wide mouth, her bosom undefined…”. In many interviews, Vidor reported that he was very happy with the wonderful performance of the talented actress who was only 26 years old ! The old veteran director stated : “Audrey is Natasha… She is fresh out the book”. For me, she gave one of her most powerful performance. In the wonderful career of this legendary Icon, we could remind of her other great performances especially in “Roman Holiday” (William Wyler /1953) “Sabrina” (Billy Wylder / 1954), “Breakfast at Tifany’s” (Blake Edwards / 1961), “The Nun‘s Story” (Fred Zinnemann / 1959), “My Fair Lady” (George Cuckor / 1964) and “Robin and Marian" (Richard Lester / 1976). From 1989 to 1993, she became a special ambassador to the United Nations UNICEF fund to help children in Latin America and Africa. She died on January 20, 1993. With Ingrid Bergman, she remains one of the most talented actresses and a woman of exception with a generous heart forever. 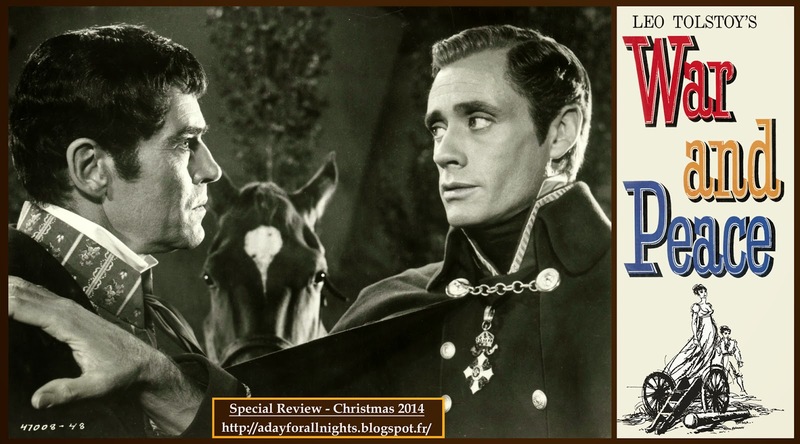 In the same vein as Henry Fonda, Mel Ferrer also gave a very fine performance with a great sense of charisma. Without any doubt, he portrayed a true aristocratic Russian. I especially like the first scene in which he faced to Henry Fonda speaking about the sense of life. The dialogues of that scene gave to the actors the opportunity to achieve the humanist spirit of the book (see hereunder). The well known British actor, Sir John Mills gave a very convincing performance as Platon, the humble peasant who in Tolstoy's mind personified the Russian soul and maybe, Tolstoy himself. As Anatole Kuragine, Vittorio Gassman confirmed that he was not only a handsome Latin lover, as they said, but also one of the most talented Italian actors of his generation and of the Italian stage. The striking Anita Ekberg remains the eternal love goddess as the vicious “femme fatal” Helene Kuragine. The veteran Austrian and theatre actor, Oscar Homolka gave a very effective performance as General Kutuzov. The Viennese born actor, Helmut Dantine is also to be remembered for his strong performance of the Russian officer Dolokhov, as well as the young British actor Jeremy Brett as Nicolas (Natasha/Hepburn's brother). With a taste of humor, Jack Cardiff remembered the shooting with an international cast : “…The actors was the mixture of nationalities, with its consequent farrago accents… All this in the highly Italianate ambience of Cinecittà in Roma…”. The premiere of the movie took place at the Hollywood Paramount Theatre the 23rd of August 1956. 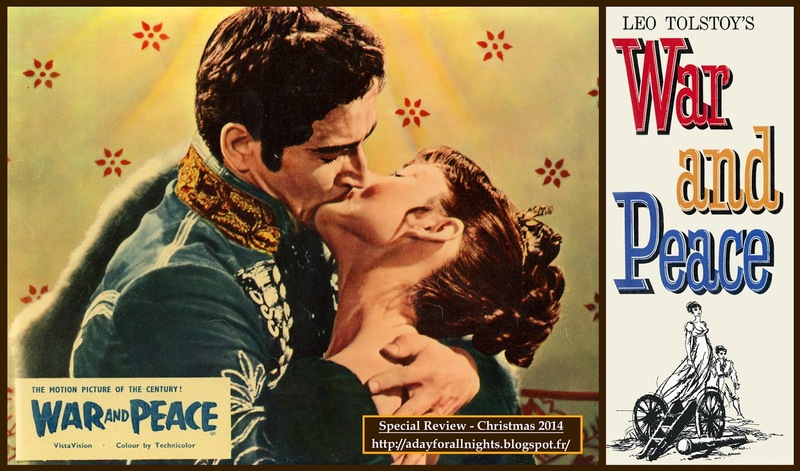 The critics qualified King Vidor’s visual version as a kind of "reader’s digest" of the book ! 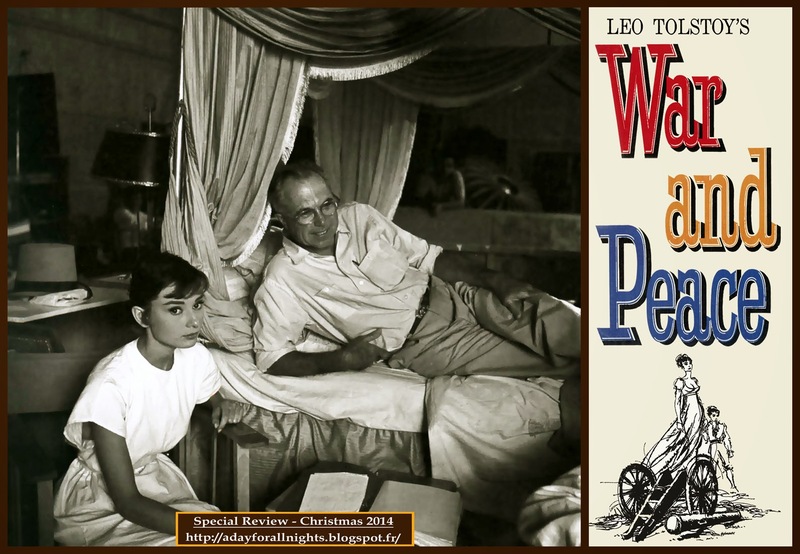 At that time, many regarded “War and Peace” as a rival to another Paramount Pictures, the biblical epic movie : Cecil B. De Mille’s “The Ten Commandments”. The first editing version had a duration of 6 h 20 minutes before it was reduced to 3 h 30 for the general theatrical release. In his autobiography, Vidor reported that the studios cut thirty minutes of the movie without asking for his previous agreement. Let us hope we will see a more complete version some day ! 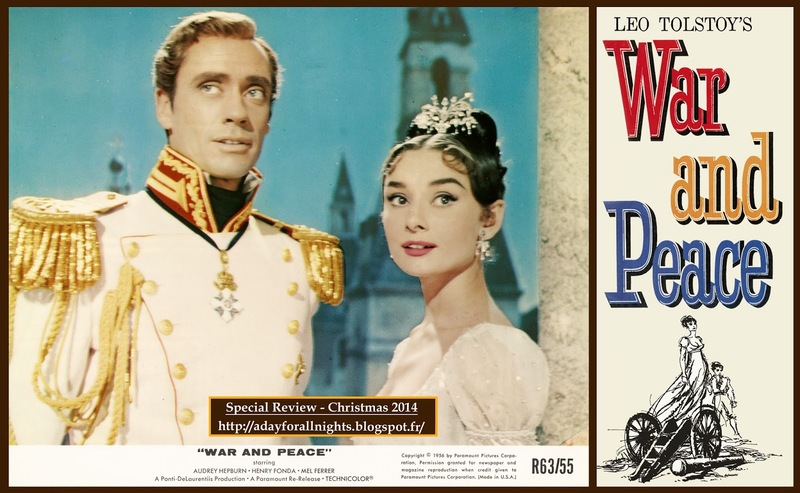 Unfortunately, “War and Peace” wasn’t nominated for the Academy Awards of 1956 as best Picture of the Year. Only Vidor and Cardiff received a nomination. King Vidor lost to George Stevens for “Giant”. The Michael Todd’s production “Around the world in 80 days” obtained the Oscar for best picture of the year. Cardiff, as already said, also lost ! Vidor’s disappointment wasn’t justified. In my opinion, his movie is outstanding. Despite the pressures from many people : producers, technical challenges and a lot of logistic difficulties on various locations, the then 60 year old director was able to complete the movie in a four month delay (from July to November 1955). Furthermore, he started the shooting before the financial budget had been completed and the final script available. Amazing ! 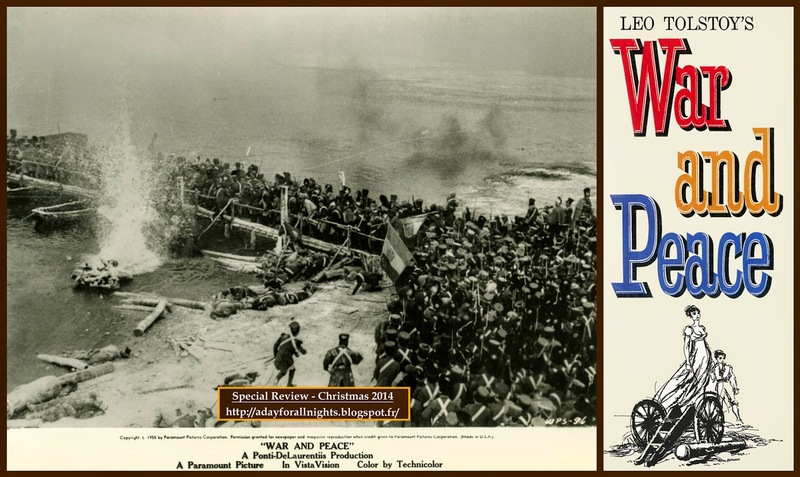 In France, the film was cut by fifteen minutes because the French distributors feared that the Napoleonic sequences (mostly because of the way Herbert Lom acted, as previously said, the part of Napoleon plus some historical errors) could make the French audience uncomfortable and jeopardize the overall receipt of the movie. There are many discrepancies between the movie and the book. But, it does not matter because, like it is, King Vidor’s movie speaks to the heart of people because of its humanism. Of course, it is likely that the 208 minutes of the first English version couldn’t cover in full the 4 parts and the 2 epilogues of the Russian monumental novel as written by Tolstoy. But, I think that the Vidor movie version is the best way for any western audience to discover this moving story on the big screen. Perhaps, it is also be a good opportunity to read the book and explore more about the Russian soul. 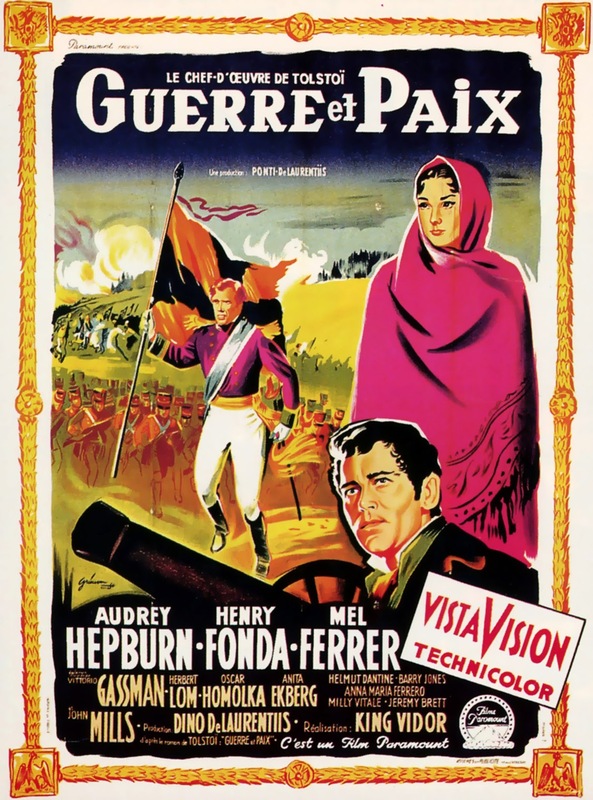 For the records again, this French – Italian - American Production of “War and Peace” wasn’t the first film adaptation to the big screen. A Russian silent version was released by Yakov Protazanov and Vladinmir Gardin in 1915 and a second by the versatile director – actor Sergei Bondarchuk in 1967 which is the most impressive with Vidor’s. This Soviet production (four parts totaling 403 minutes !) was the most expensive version ever made with a cost of $ 100 000 000 (actual today estimation $ 700 000 000) ! And the money can be seen on the screen ! The historical reconstruction of Borodino is the most awesome battle ever photographed, 120 000 soviet soldiers swarm over the screen portraying both Russian and French Armies. Some historians reported that there were more soldiers on the set than in the real battlefields ! Bondarchuk that portrayed Pierre was physically absolute ringer for the original Tolstoy‘s description. Like Audrey Hepburn, the 17 year old dancer Ludmilla Savelyeva as Natasha gave also a convincing performance and grow up with the production of film which required almost five years (spread over 1963 to 1967) ! 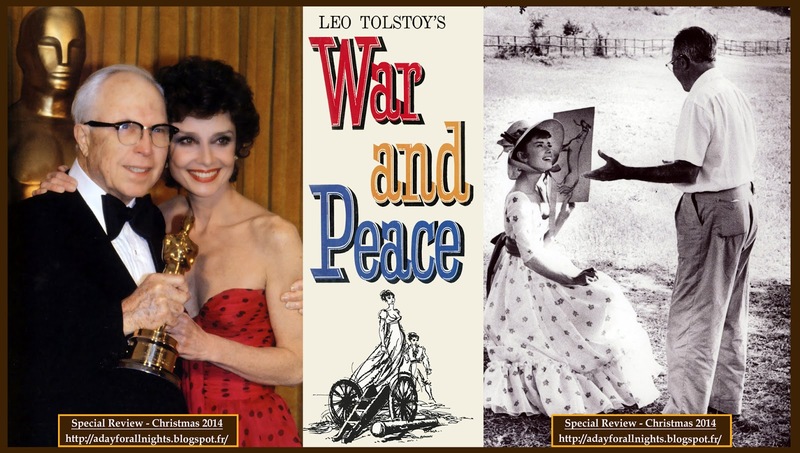 The Soviet version won the Oscar for best foreign movie of the year. This can explain why Dino De Laurentis agreed to produce three years later “Waterloo” (1970 / with Rod Steiger and Christopher Plummer). But unfortunately, the movie was a big flop at the US box office. 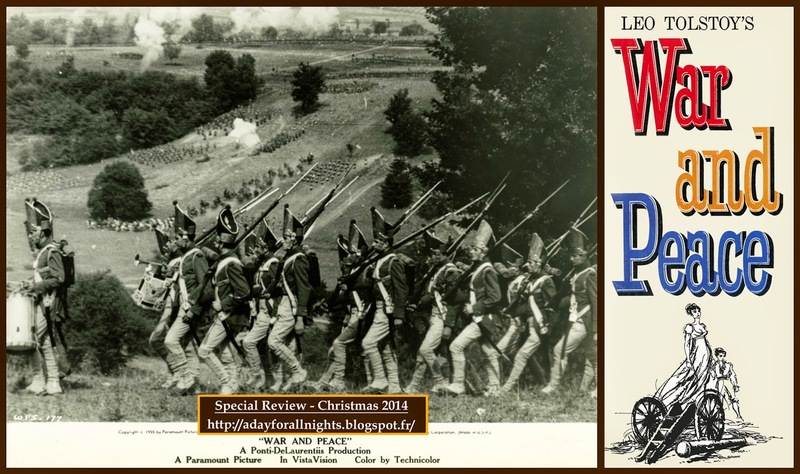 It is unfair, because the movie can be regarded as a fascinating reconstruction of the emblematic battle. Then, in 1975, the acclaimed American director Woody Allen directed a very funny movie based on the Tolstoy’s story in “Love and Death” with Diane Keaton. Two TV adaptations should be retained. The BBC produced his own version and chose John Davies to direct the ambitious project of 1045 minutes based on a screenplay by Jack Pulman. The great British actor Anthony Hopkins won the BATFA for best actor of the year for portraying the role of Pierre in 1972. Other film adaptations had already been planned. 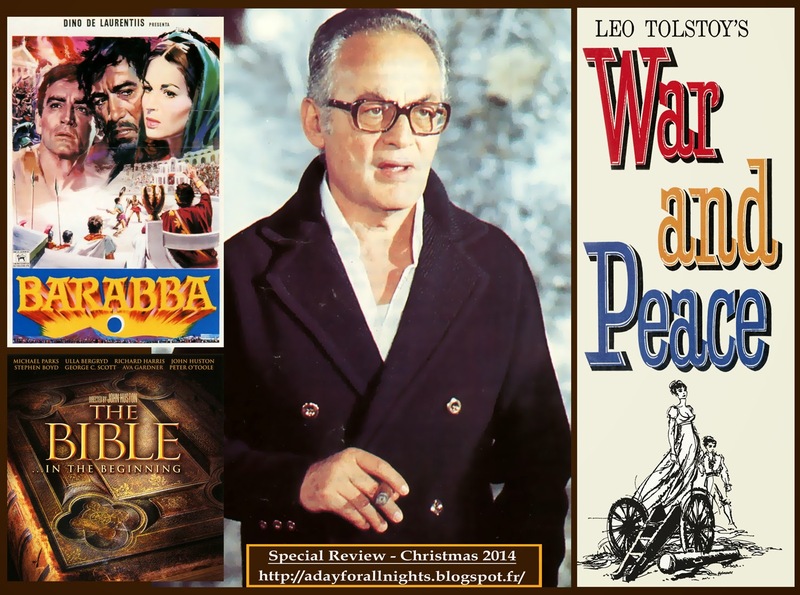 In 1937, the great producer-director Sir Alexander Korda (1886 – 1956) tried to adapt Tolstoy’s masterpiece for the screen with Sir Laurence Oliver (1907 - 1989) and Merle Oberon (1977 – 1979). Unfortunately, he failed. 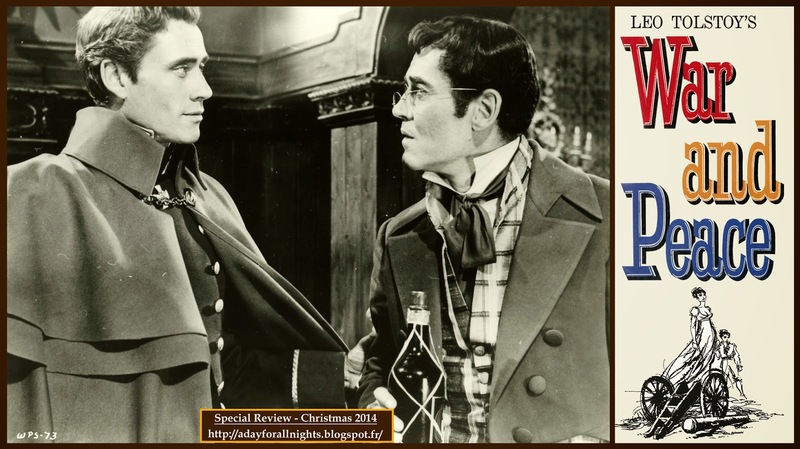 Like De Laurentiis and Carlo Ponti, Korda was also the great showman of the British cinema Industry of the period (London Film Productions : “That Lady Hamilton” (1941) and “The Four feathers” (Zoltan Korda / 1939)…). All these efforts to adapt Tolstoy’s masterpiece can be saluted as the wills of some people to remind of the powerful work to young generations and have the message of the great novelist passed on to other peoples all over the world. “The subject of history is the life of peoples and of humanity” Leo Tolstoy. 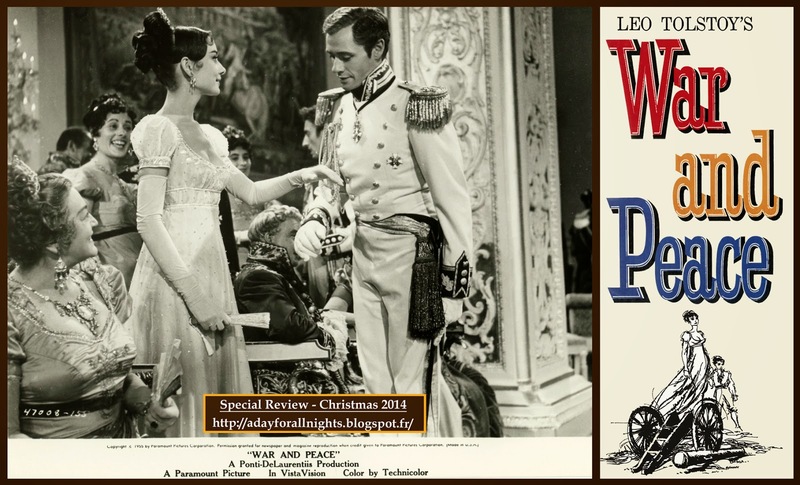 Although, I am not a movie historian, I hope you will read this review as a kind of tribute to the stupendous efforts by King Vidor, Sergei Bondarchuk and all people that bring respect to the great work of the Russian Philosopher Lev Nikolayevich Tolstoy. 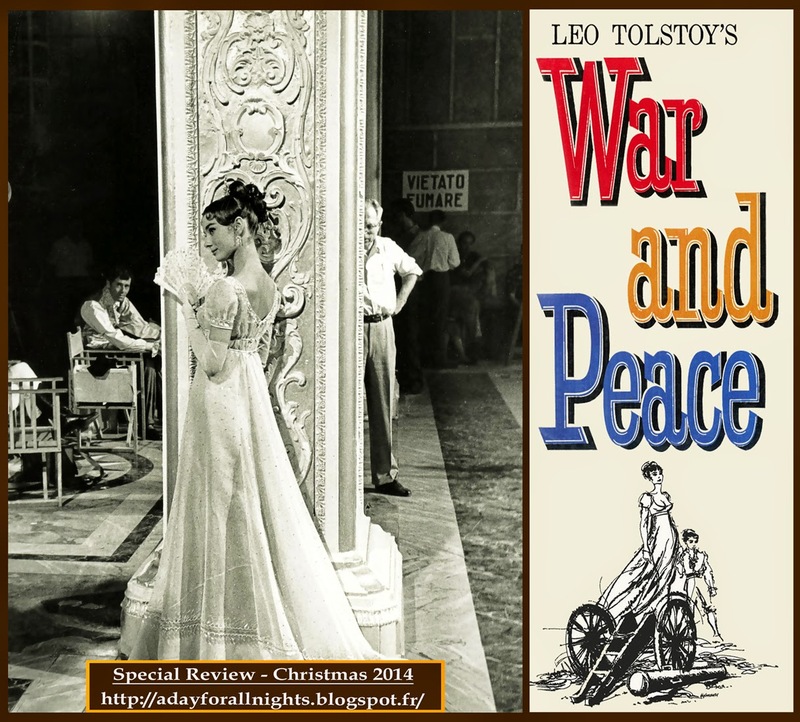 I think the Christmas time is quite appropriate to recall the peaceful and friendship message of the immortal book through King Vidor' film. As a final word, I wish to dedicate with humility the review of this masterpiece to all people who, all over the world, fight to keep our world in Peace. Merry Christmas 2014 and Happy New Year 2015 to all. “The most difficult thing – but an essential one- is to love Life, to love it even while one suffers, because Life is all. Life is God, and to love Life means to love God”. Tolstoy “War and Peace” (1869). Pierre : “ I want to discover…everything ! I want to discover why I know what’s wrong and still do what’s wrong. I want to discover what happiness is, and what value there is in suffering. I want to discover why men go to war, and what they really say deep in their hearts when they pray. I want to discover what men and women feel when they say they love. There’s enough to keep busy. It’s hard to understand someone like me. Everything is so clear for you. You know exactly what must do”. Pierre : “You’re different from me. You study, you become enlightened. I study, I become confused. You love, you marry. You believe, you act. There’s a war, you serve”. Andrei : “If only, I really answered to your description”. Pierre : “I know you. I‘m not wrong”. 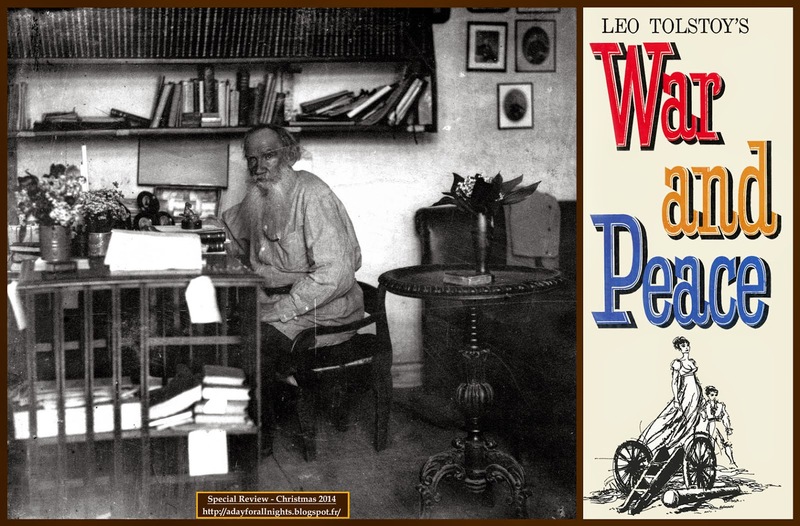 - “War and Peace” by Leo Tolstoy (in English / translation by Richard Pevear and Larissa Volokhonsky), Vintage Classic – Reprint Edition (Paperback – 1 296 pages), Dec. 2008. 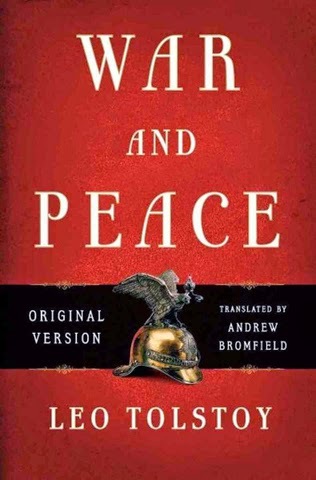 - “War and Peace” by Leo Tolstoy (in English / translation by Aylmer Maude and Louise Maude), Henry Gifford – Oxford University Press (Paperback – 1 392 pages), 1998, UK. 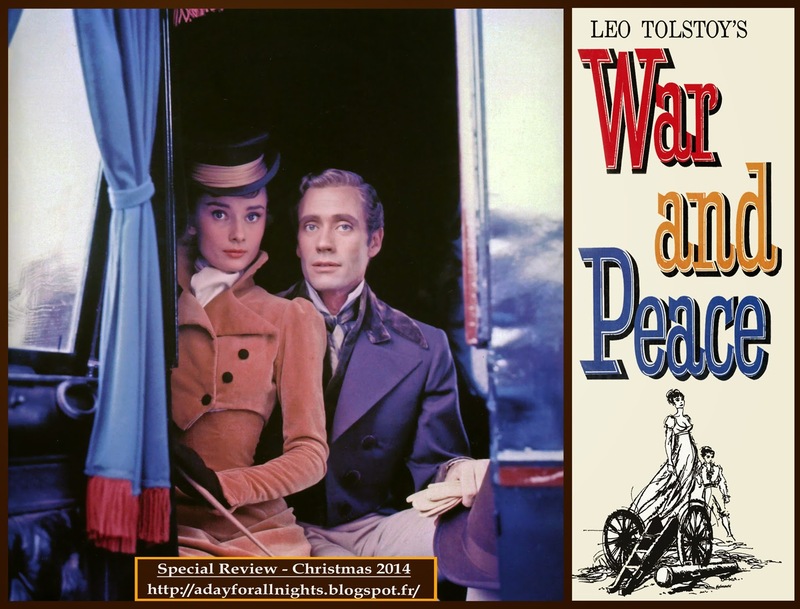 - “War and Peace” by Leo Tolstoy (in French / translation by Boris De Schloezer), Gallimard (Paperback Tome 1– 1 023 pages ; Tome 2 – 1 055 pages ), 2002, France. 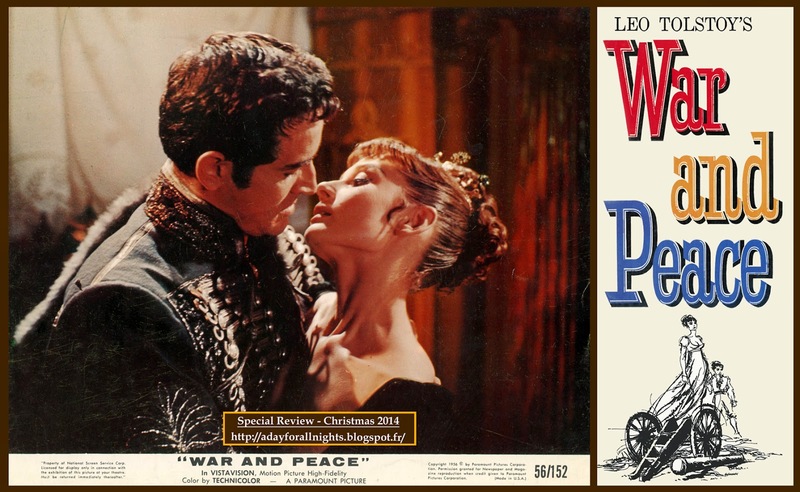 - “The Picture Story of War and Peace” (1956), directed by King Vidor, adapted by Bernard Geis from the novel and the motion picture (in English, 120 pages with black & white photos), Frederick Fell, Inc, New York, USA. 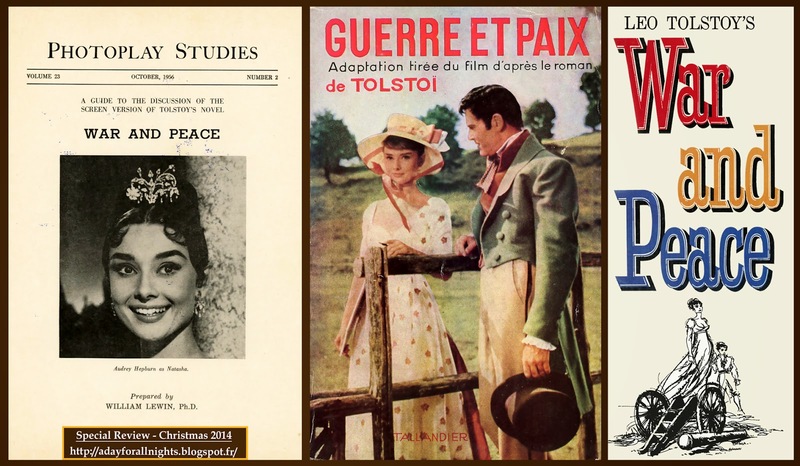 - “War and Peace” (1956), Photoplay Studies, a guides to discussion of the screen Version of Tolstoy’s Novel by William Lewin (in English), Volume 23 (N°2), Educational & Recreational Guides, October 1956, New York. 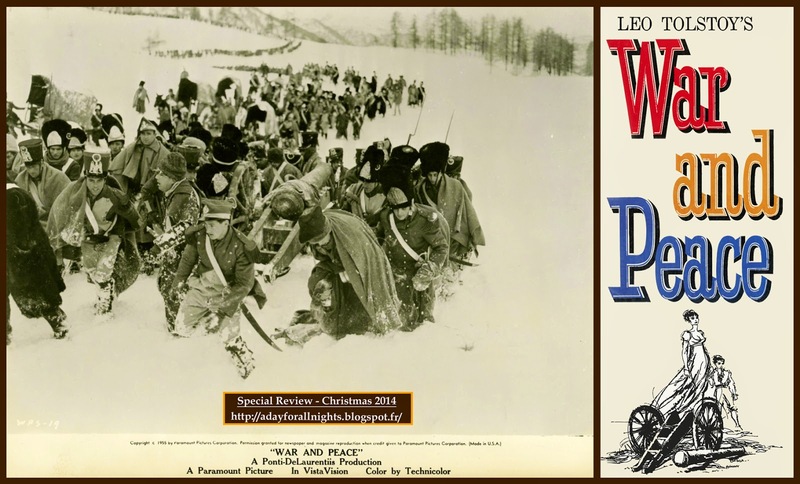 - “War and Peace” (1956), directed by King Vidor, Souvenir Book (in Japanese, 20 pages with color and black & white photos), TOWA / Pan Pacific Production INC, 1956, Japan. 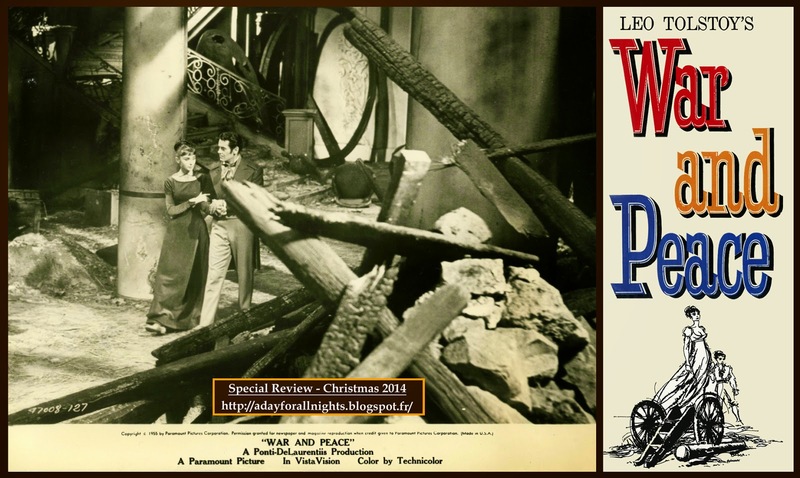 - “War and Peace” (1956), directed by King Vidor, adapted by Noëlle Didier from the motion picture (in French with black & white photos), Editions Jules Tallandier, 1957, France. - “The Great Adventure Films” by Tony Thomas (in English), Citadel Press Book, 1976, USA. - “The Hollywood Epic” by Foster Hirsch (in English), A. S. Barnes and Co, Inc, Canbury New Jersey, 1978, USA. - “Great Film Epics” by Mike Munn (in English), Argus books Ltd, Watford, 1982, UK. - “Epic !” by Baird Searles (in English), Harry Abrams Inc, 1990, USA. - “Adventure and the Cinema” (in English), by Ian Cameron, foreword by Douglas Fairbanks Jr., Studio Vista Publishers, 1973, UK. - “Napoléon à l’Ecran” by David Chanteranne and Isabelle Veyrat-Masson (in French), Nouveau Monde Editions / Fondation Napoléon (La Bibliothèque Napoléon), 2003, France. 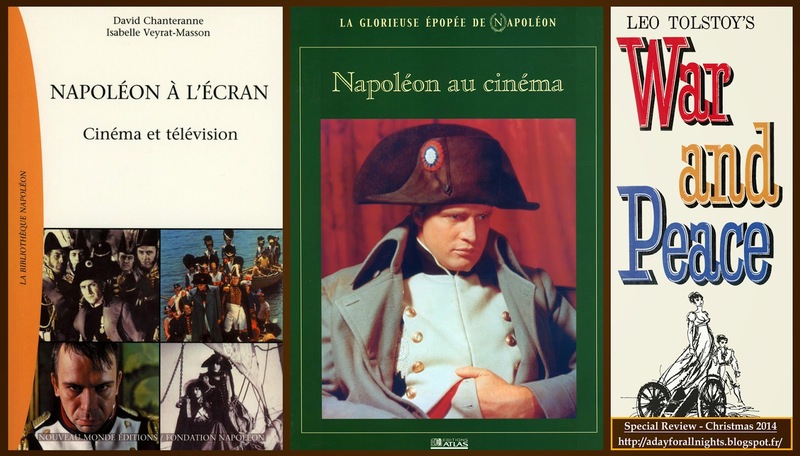 - “Napoléon au Cinéma” by Patrick Falcon, Renée Grimaud and François Pernod(in French), Editions Atlas (La Glorieuse Epopée de Napoléon), 2006, France. - “A Tree is a Tree” Autobiography by King Vidor (In English), Samuel French Inc plays (September 1989), USA. - “La Grande Parade” by King Vidor (in French / translation of Autobiography “A tree is a tree by Catherine Berge and Marquita Doassans), Ramsay Edition, 1982, France. 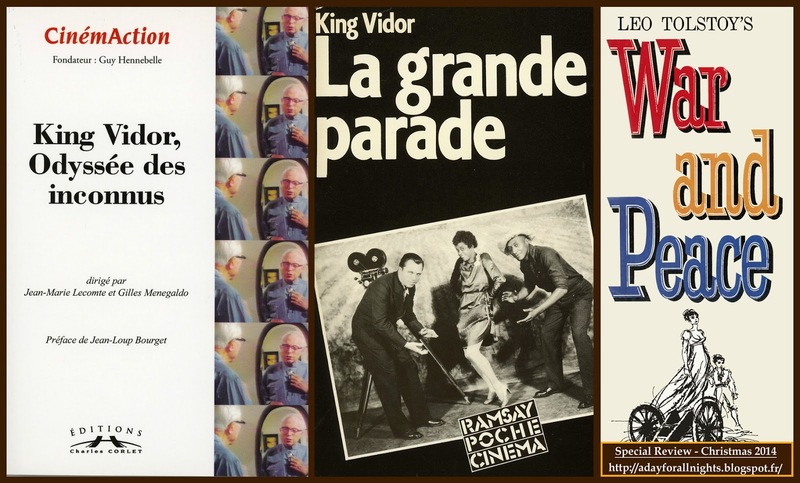 - “Directors Guild of America Oral History : King Vidor -Book N°4 by Nancy Dowd and David Shepard (in English), Scarecrow Press (September 1, 1988), USA. - “King Vidor, Odyssée des inconnus” by Jean-Marie Lecomte and Gilles Menegaldo (in French), foreword by Jean-Loup Bourget, Cinéma Action, Editions Charles Corlet (http://www.corlet-editions.fr), 2014, France. - “The Life of Audrey Hepburn” by Donald Spoto (in English), Harmony Books, 2006, USA. 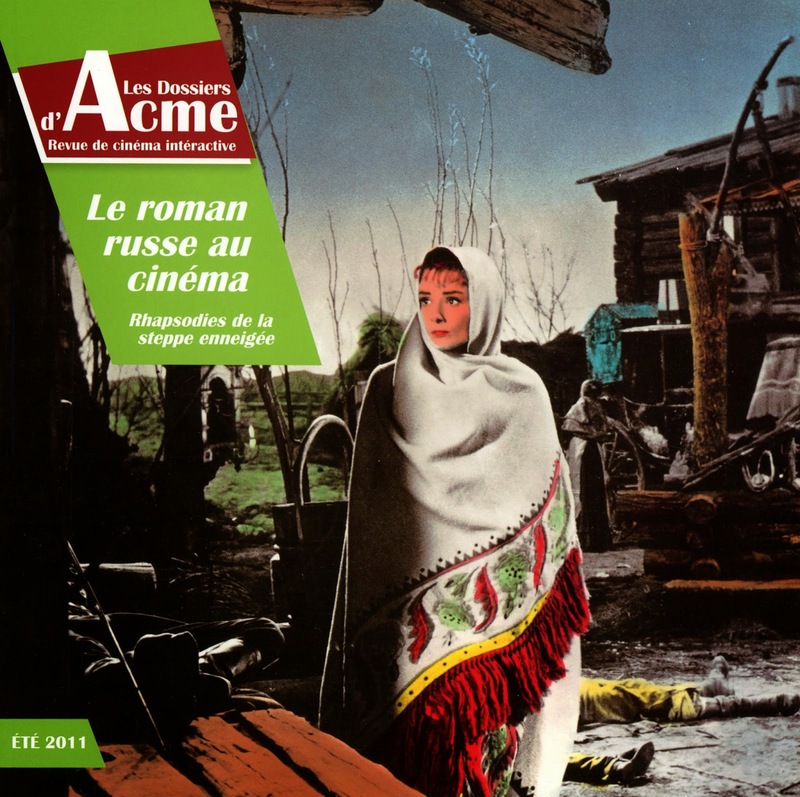 - “Audrey Hepburn : Histoire d’une femme d’exception” by Donald Spoto (in French), Hors Collection, 2007, France. 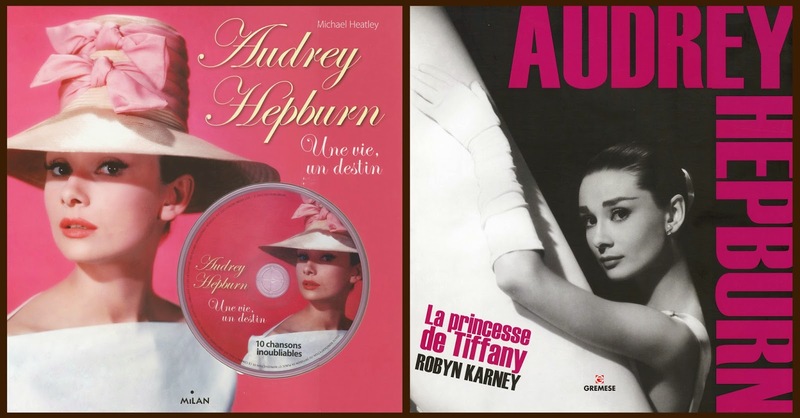 - "Audrey Hepburn : La Princesse de Tiffany” by Robert Karney (in French), Editions Gremese, 2011, Italy. - “A Star danced, The Life of Audrey Hepburn” by Robyn Karney (in English), Arcade publishing, 2012, USA. - “Audrey : The Life of Audrey Hepburn” by Charles Higham (in English), MacMillian Publishing, 1984, UK. 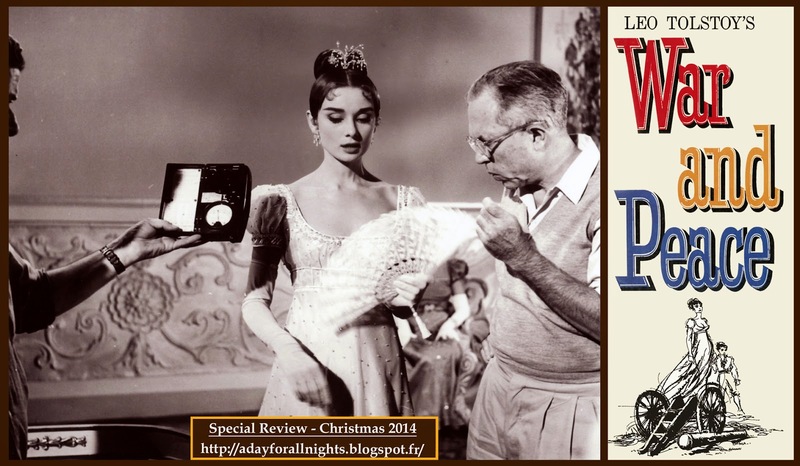 - “Audrey : The Fair Lady of the Screen” by Ian Woodward (in English), Virgin Books, 1993, UK. - “Audrey Hepburn” by Klaus-Jürgen Sembach (in French / translation by Valérie Agema), Shirmer / Mosel, 1993, Germany. - “Audrey Hepburn” by Christophe Valès, Brigitte Valotto and Laurent Béranger (in French), Regard Magazine N°4, 1993, France. - “Movie & Icons : Audrey Hepburn” by F. X. Feeney, Taschen, 2006, Germany. - “Audrey Hepburn, La dame de Coeur” by Henry-Jean Servat (in French), Editions Hors Collection / Mondadori Printing, 2011, France. - “Audrey 100” by Ellen Fontana (in French / translation by Suzy Borello), foreword by Sean Hepburn, The Audrey Hepburn Children’s Fund / Editions Milan, 2011, France. - “Audrey, Une vie en Image” by Carol Krenz (in French / translation by Marie-Line Salybaugh a&nd Anne Blot), Editions Soline, 1998, France. - “Irrésitible Audrey” by Iris Lanelou (in French), Galilei Books, Edition du Chêne (Hachette Livre), 2012, France. - “Audrey Hepburn : Une Vie, Un Destin” by Michael Heatley (in French / translation by Pascale Courtin), Editions Milan, 2012, France. - “Audrey à Rome” by Ludovica Damiani and luca Dotti (in French), Gallimard Loisirs, 2014, France. - “Henry Fonda, My Life” autobiography by Henry Fonda and Howard Teichmann (in English), Orion Productions, 1981, USA. 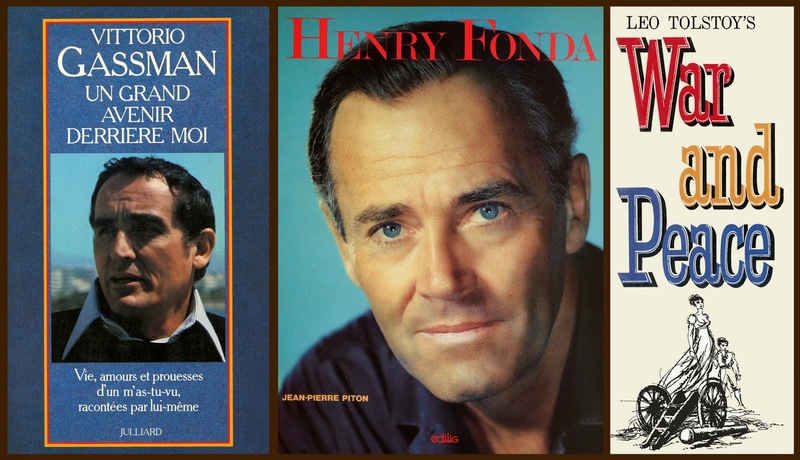 - “Henry Fonda, Ma Vie” autobiography by Henry Fonda and Howard Teichmann (in French / translation by Marion Souaille), Editions Michel Lafond, 1982, France. - “Henry Fonda, A biography” by Allen Roberts and Max Goldstein (in English), Mac Farland & Company, 1984, USA. 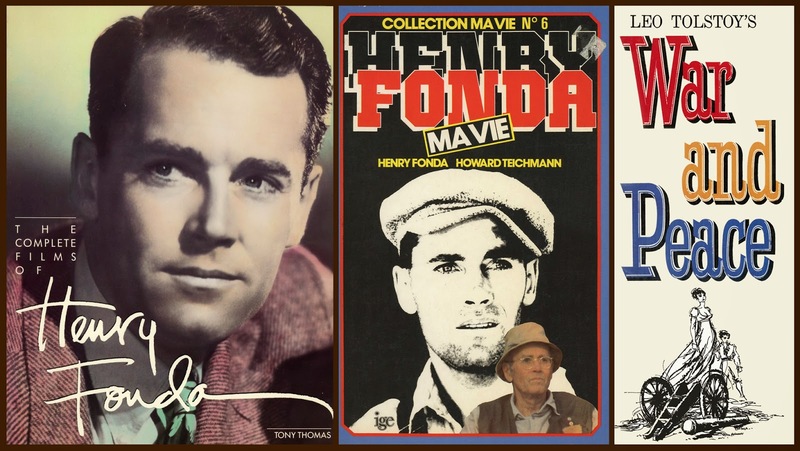 - “The Complete films of Henry Fonda” by Tony Thomas (in English), Citadel Press, 1983, USA. - “Henry Fonda” by Jean-Pierre (in French), Editions Edilig, 1986, France. - “Vittorio Gassman, Un Grand Avenir derrière Moi” Autobiography by Vittorio Gassman (in French / translation by Roland Stragliati), Editions Julliard, 1982, France. - “Nino Rota, Un Timido Protagoniste del Novecento Musicale” by Francesco Lombardi (in Italian), Cidim / EDT, 2012, Italy. 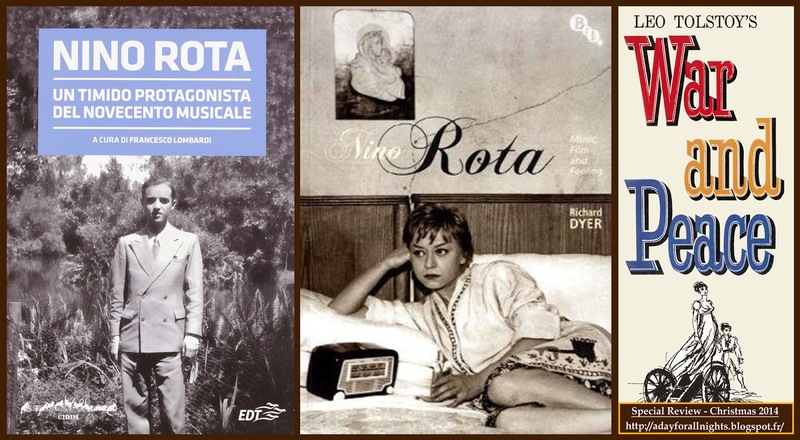 - “Nino Rota, Music, Film and Feeling” by Richarl Dyer (in English), BFI Publishing, 2010, UK. 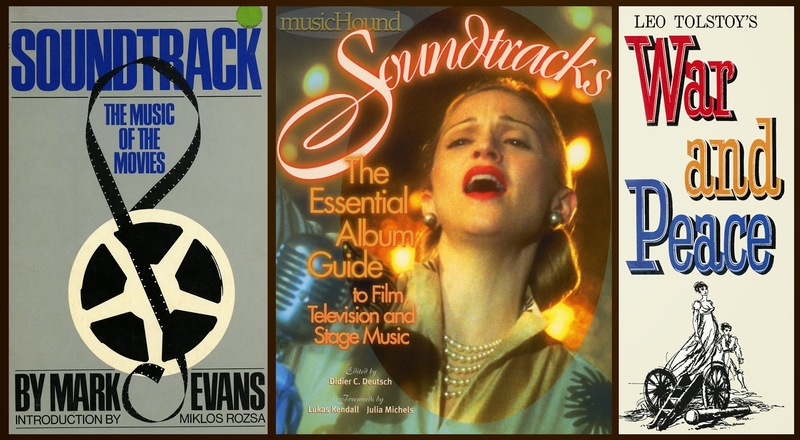 - “Soundtrack, The Music of the Movies” by Mark Evans (in English), Foreword by Miklos Rozsa, Da Capo Press, 1979, USA. - “Film Score : The Art & Craft of the Movie Music” by Tony Thomas (in English), 1991, Riverwood Press, USA. - “La Musique du Film” by Alain Lacombe and Claude Rocle (In French), Editions Francis Van de Velde, 1979, France. - “Sound and Vision, 60 Years of Motion Picture Soundtracks” by Jon Burlingame (in English), Foreword by Leonard Maltin, Billboard Book, 2000, USA. - “Music Hound - Soundtracks” by Didier C. Deutsch, foreword by Lukas Kendal and Julia Michels, (in English), Visible Ink Press, 200, USA. - “La Musique de Film” by Pierre Berthomieu (In French), Editions klincksieck, 2004, France. - “1 000 compositeurs de Cinéma” by Jean-François Houden (In French), Editions Cerf-Corlet (7e Art / Cinéma Action), 2002, France. - “Magic Hour” by Jack Cardiff (in English), foreword by Martin Scorsese, Faber and Faber, 1996, UK (www.Jackcardiff.com). - “Cameraman, The Life and Work of Jack Cardiff” by Graig McCall, Optimum Home, Studio Canal, DVD Zome 2, Ref. OPTD1854, Stereo / Mono, Pal 1.78.1 , English language (with English Substitles), (Bonus : Interview with Graig McCall by Ian Christie, Jack’s actress portraits, Jack’s behind the scenes movies, Cinematographer and dirtector relationship, Working with three strip Technicolor, Theatrical Trailers and Photo Galleries (Jack’s actress portraits and Production Stills)), 2010, UK. 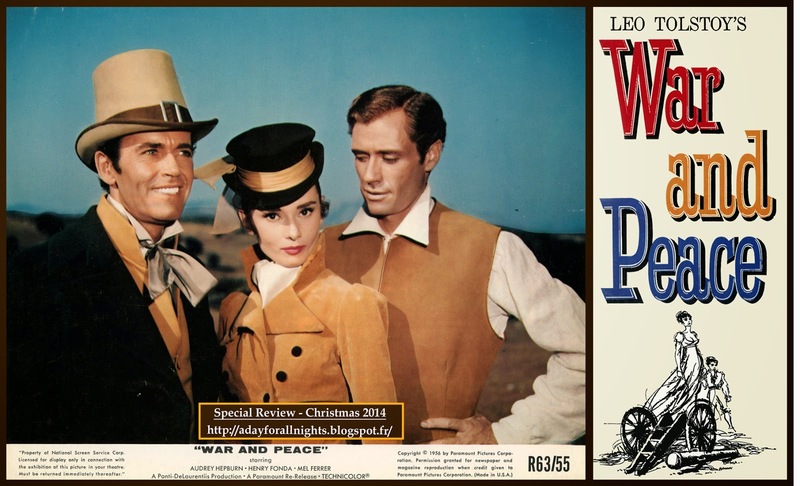 - “War and Peace” by King Vidor, 1956, Paramount picture, DVD zone 1, Ref / ASIN B00006JU7S, Wide Screen Edition, Mono Sound, NTSC, 1.78.1. (208 minutes), English language (with English Substitles), (Bonus : Theatrical Trailers (Behind the scenes of the movie) and re-release trailer), 2002, USA. 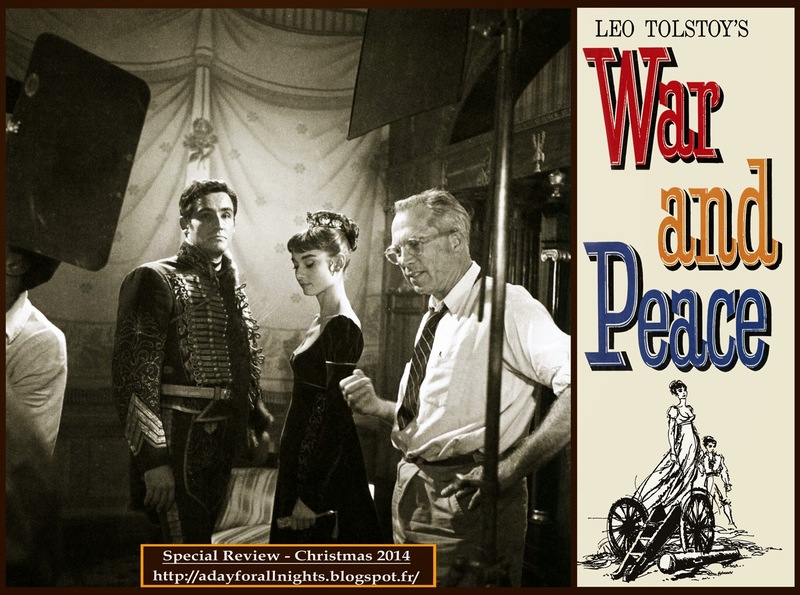 - “War and Peace” by King Vidor, 1956, Paramount picture, DVD zone 2, Ref / ASIN B00DE6NGXA, Wide Screen Edition, Mono Sound, NTSC, 1.78.1. 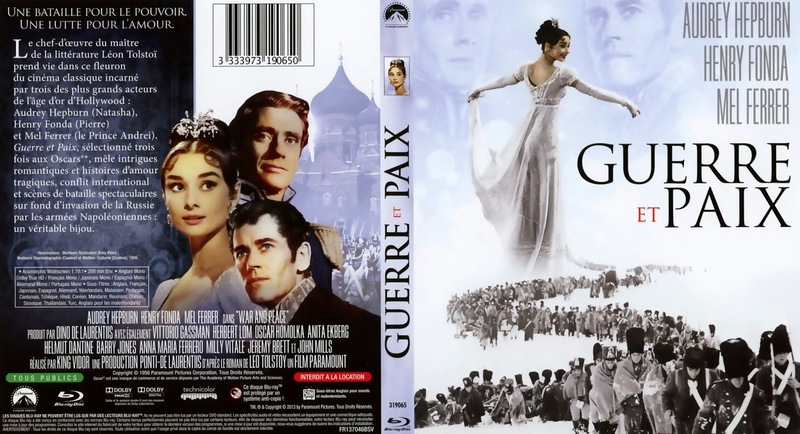 (208 minutes), English, French and Spanish languages (with English, French, Greek, Portuguese Substitles), (Bonus : Theatrical Trailer (Behind the scenes of the movie) and re-release trailer), 2003, France. 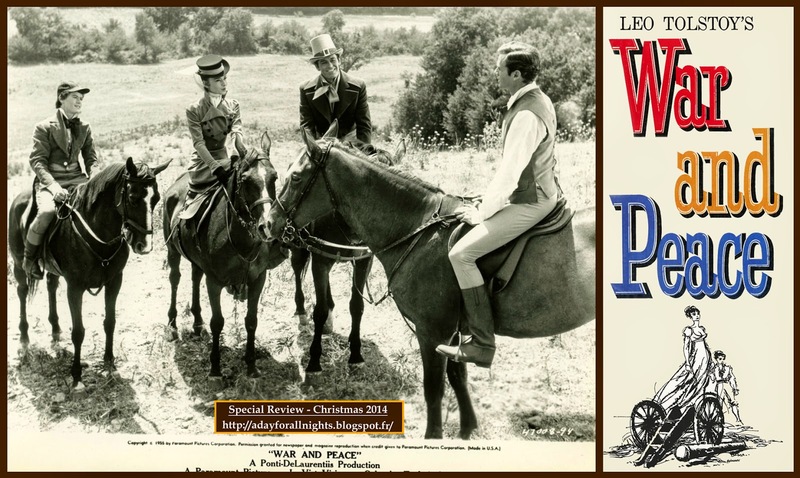 - “War and Peace” by King Vidor, 1956, Paramount picture, Blu ray zone B, Ref / ASIN B00DE6NGXA, Wide Screen Edition, Mono Sound, NTSC, 1.78.1. (208 minutes), English, French and Spanish, German, Japanese and Portuguese languages (with English, French, Greek, Portuguese Substitles), (Bonus : Theatrical Trailer), 2013, France. 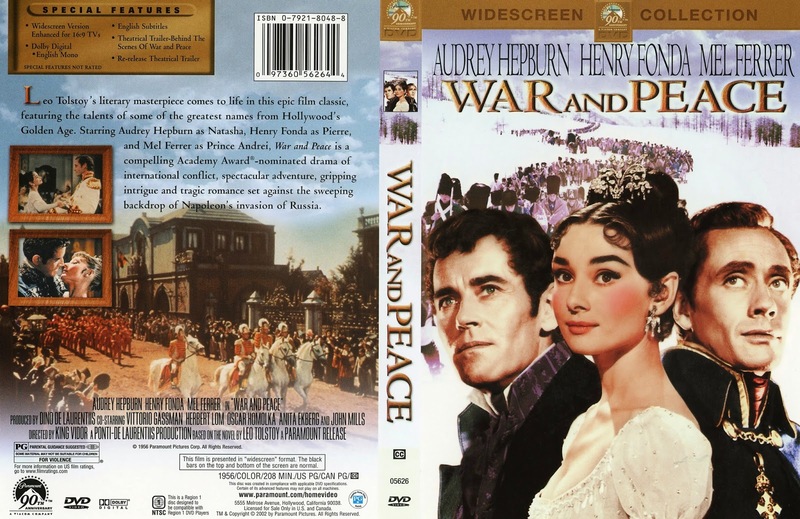 - “War and Peace” by King Vidor, 1956, Paramount picture, Blu Ray zone A, Ref / ASIN B00NW10QOO, Wide Screen Edition, Mono Sound, NTSC, 1.78.1. (208 minutes), English, French and Spanish, German, Japanese and Portuguese languages (with English, French, Greek, Portuguese Substitles), (Bonus : Theatrical Trailer), 2015, USA. 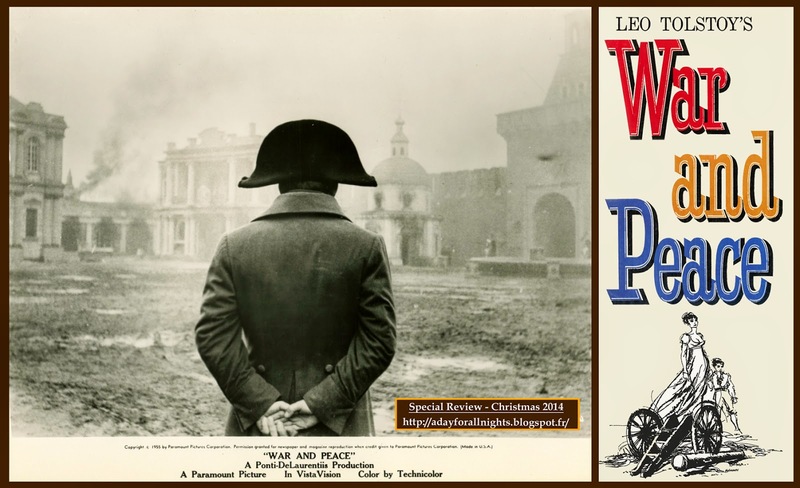 - Original Score of “War and Peace” by Nino Rota, (12 tracks – Monophonic Sound – 43.39 minutes), produced by Varese Sarabande (VSD- 5225), 1989 – CBC Special Products USA ; This album contains a special note by Willard Carroll. 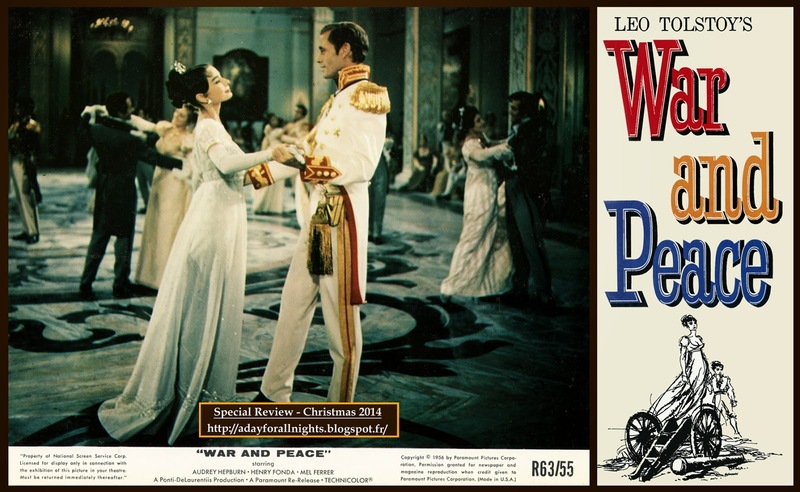 - Reissue of the Original Score of “War and Peace” by Nino Rota (12 tracks – Monophonic Sound – 43.41 minutes) produced by Cherry Red Records (ACMEM147CD), 2008, UK. This album contains a special note by Christopher Evans. - “Nino Rota Greatest Hits” by Nino Rota, (18 tracks – Stereo/Mono – 75.04 minutes) produced by Vivi Musica Soundtracks (VCDS 7001)1994, Italy. - Nino Rota “Live in Japan”, Concert in Tokyo on March 21, 1976 (22 tracks - Stereo – 74.33 minutes) Symphonic Suites conducted by Nino Rota and performed by The New Japan Philharmonic, produced by Toshiko Ohinata (SLCS – 5017), 1993, Japan. - Nino Rota “Live in Japan”, Concert in Tokyo on March 21, 1976 (22 tracks - Stereo – 74.33 minutes) Symphonic Suites conducted by Nino Rota and performed by The New Japan Philharmonic, produced by Toshiko Ohinata (KCIP 694), 2001, Japan. 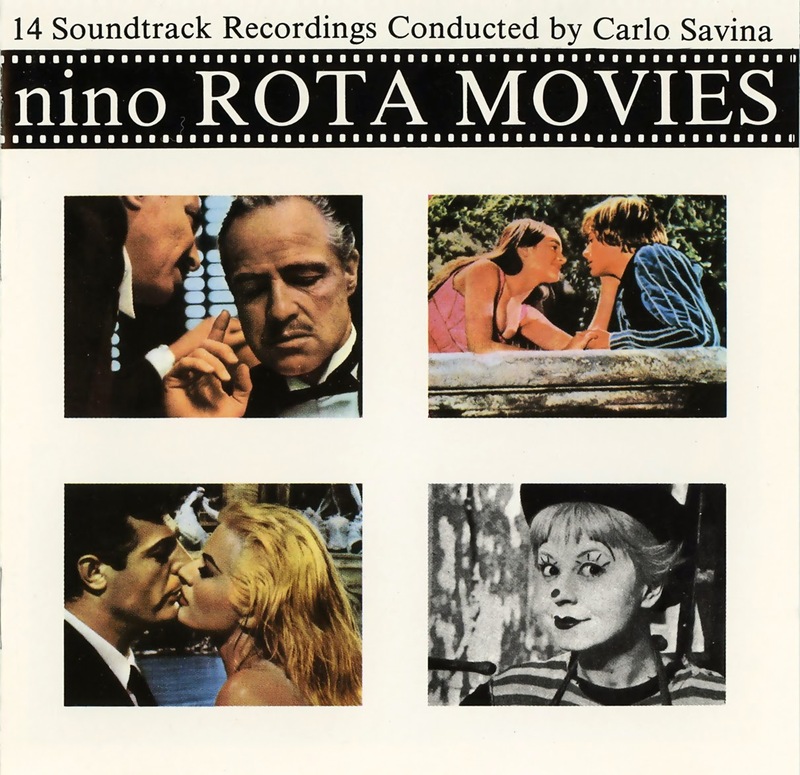 - “Nino Rota Movies” (14 tracks – Stereo – 60.09 minutes) Symphonic Suites conducted by Carlo Savina, produced by CAM Records (822 747 2), 1984, Italy. 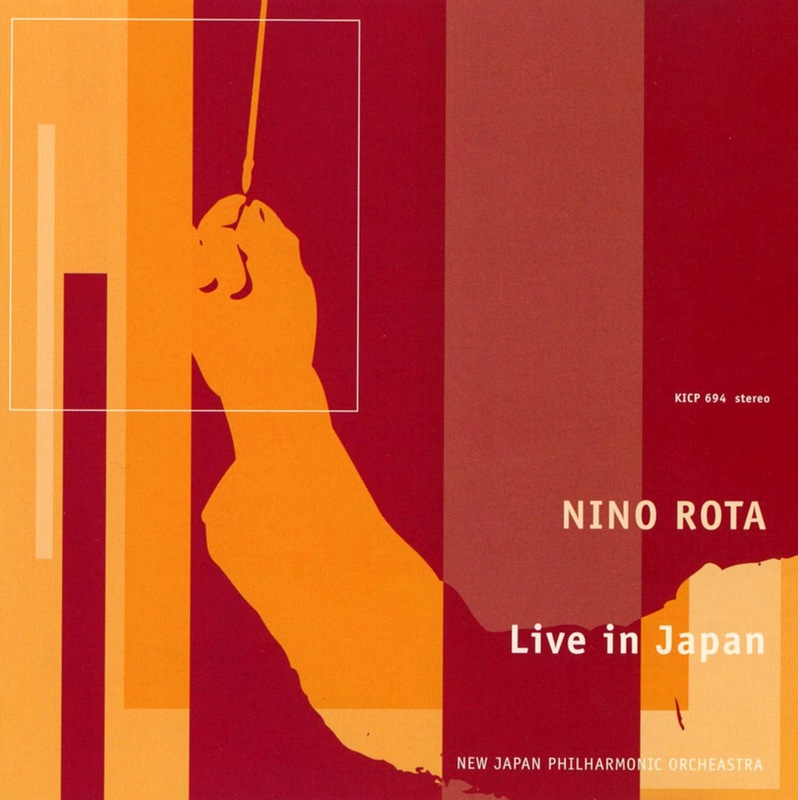 - “Nino Rota plays Nino Rota” (17 tracks – Stereo – 67.06 minutes) produced by King Records (KICP 333), 1993, Japan. - “Nino Rota Film Music” (17 tracks – Stereo – 59.32 minutes) produced by EMI Classics, Gianluigi Gelmetti conducted the Monte Carlo Philharmonic orchestra, 1992, Germany. 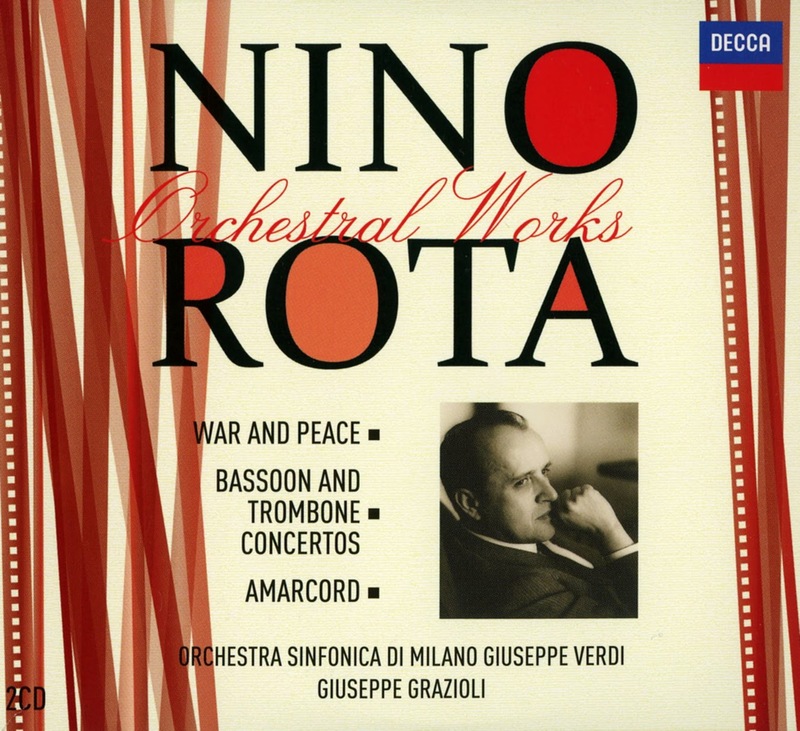 - “Nino Rota, Orchestral Works” (2CDs -15 + 15 tracks – Stereo – 60.09 minutes) Symphonic Suites conducted by Giuseppe Grazioli, produced by DECCA Records / Universal Music Italia (2 CD 481 0394), 2013, Italy. 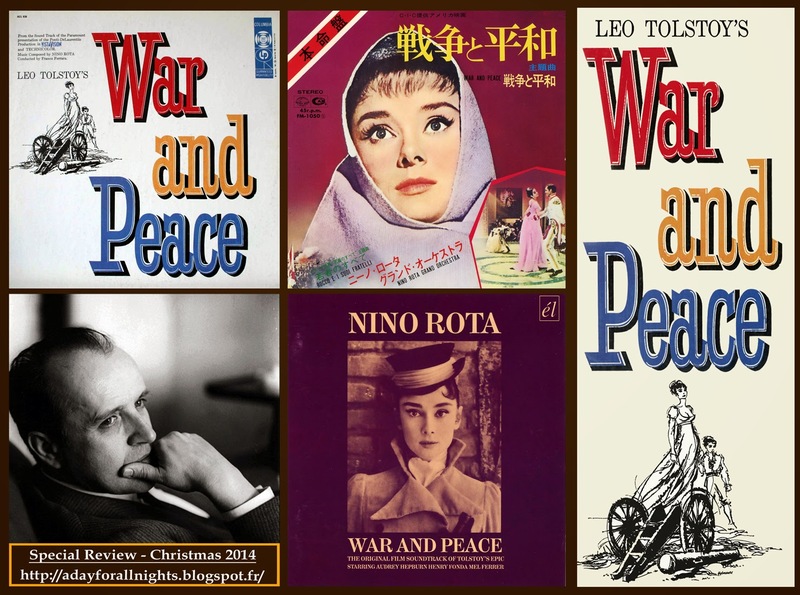 - LP Album “War and Peace” by Nino Rota, (12 tracks – Monophonic Sound), Columbia Records (CL 930), 1956, USA. 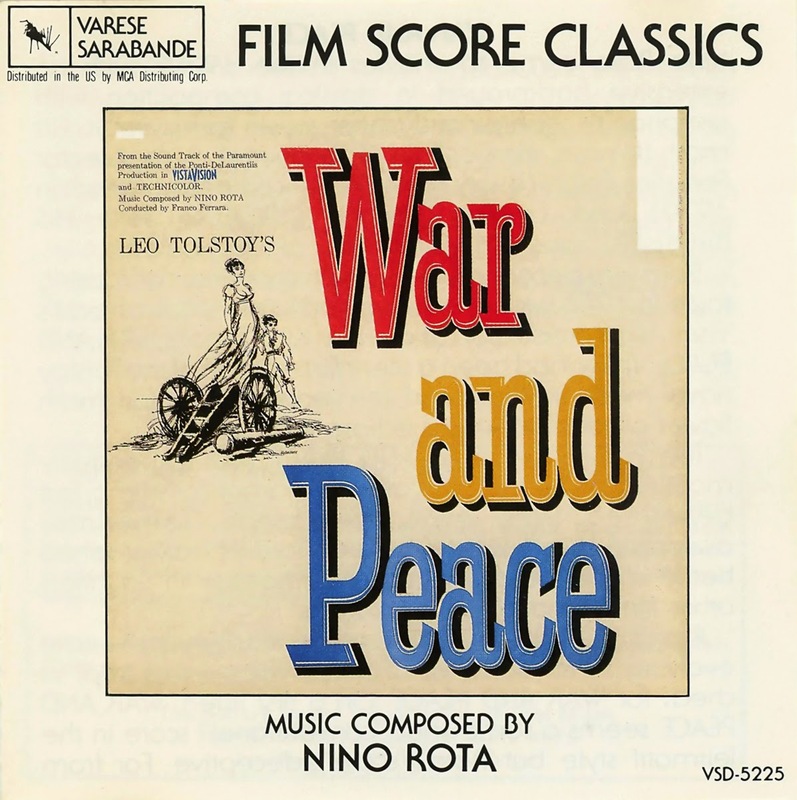 - LP Album (Reissue) “War and Peace” by Nino Rota, (12 tracks – Monophonic Sound – “360” Sound), Columbia Special Product / Columbia Records (ACL 930), 1978, USA. - EP “Suite from War and Peace” by Nino Rota, (1 track – Stereophonic Sound – 3.18 minutes), King Records (FM 1050), 1973, Japan. - LP Album “Nino Rota, Musiche da Film” by Nino Rota, (12 tracks – Stereophonic Sound), Symphonic Suites conducted by Carlo Savina, produced by CAM Records (SAG 9054), 1973, Italy. - LP Album “Les plus grandes Musiques de Films de Nino Rota” by Nino Rota, (12 tracks – Stereophonic Sound), Symphonic Suites conducted by Carlo Savina, produced by Ibach Discodis (60 542), 1979, France. 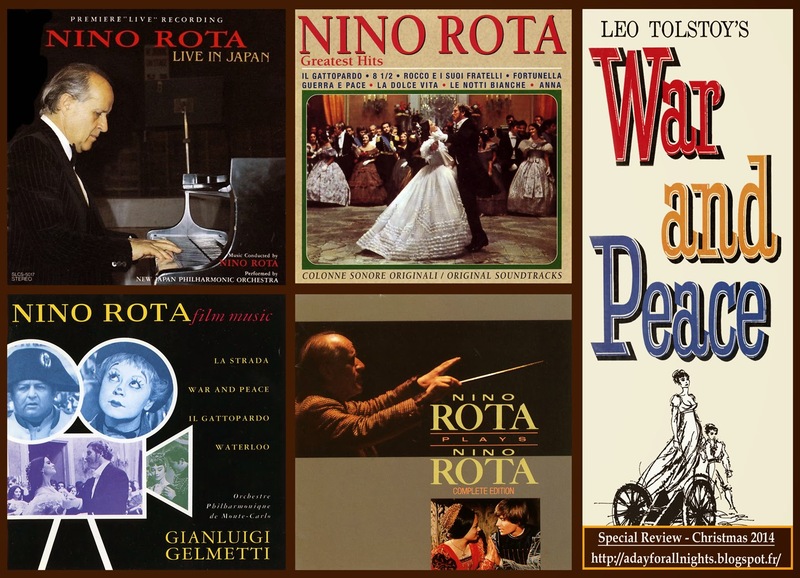 - LP Album “Concerto di Musiche da Film, Nino Rota” by Nino Rota, (13 tracks – Stereophonic Sound), Symphonic Suites conducted by Nino Rota and performed by The New Japan Philharmonic, produced by CAM Records (Lineatre) (ZNLA 33040), 1977, Italy.